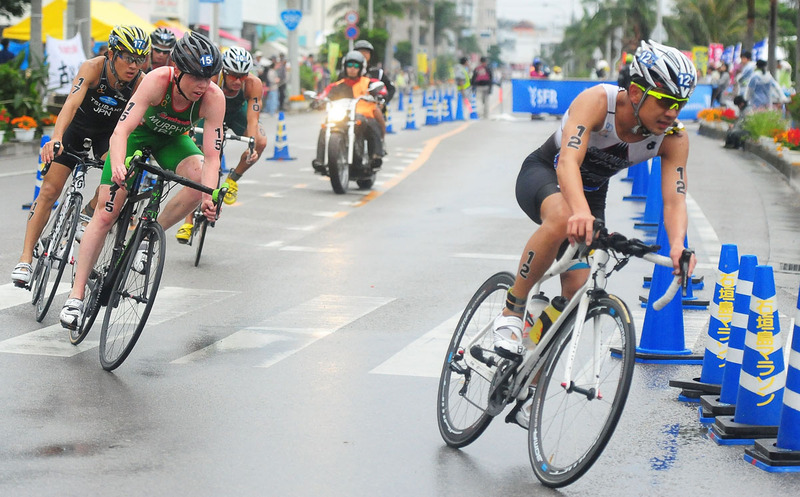 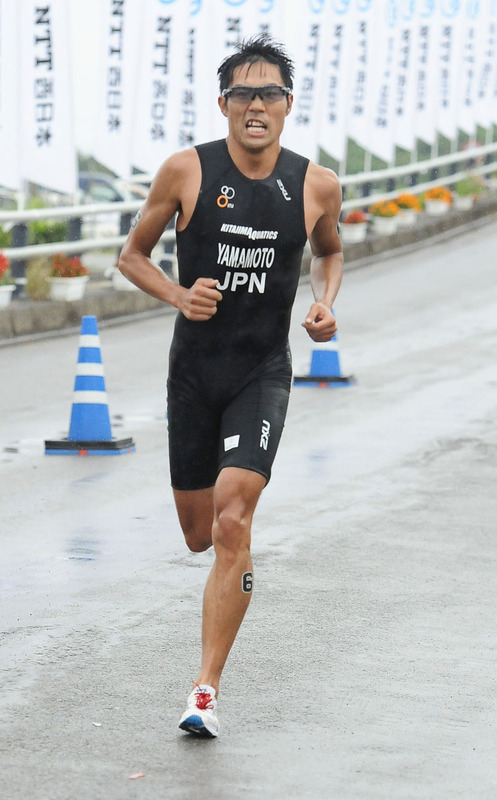 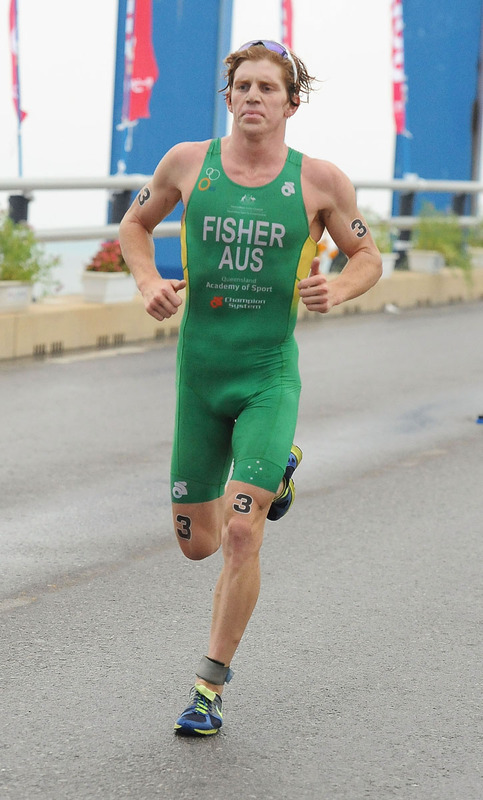 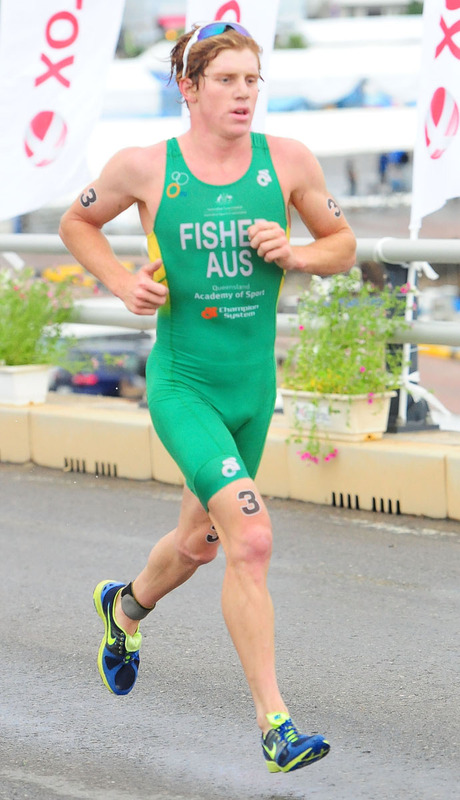 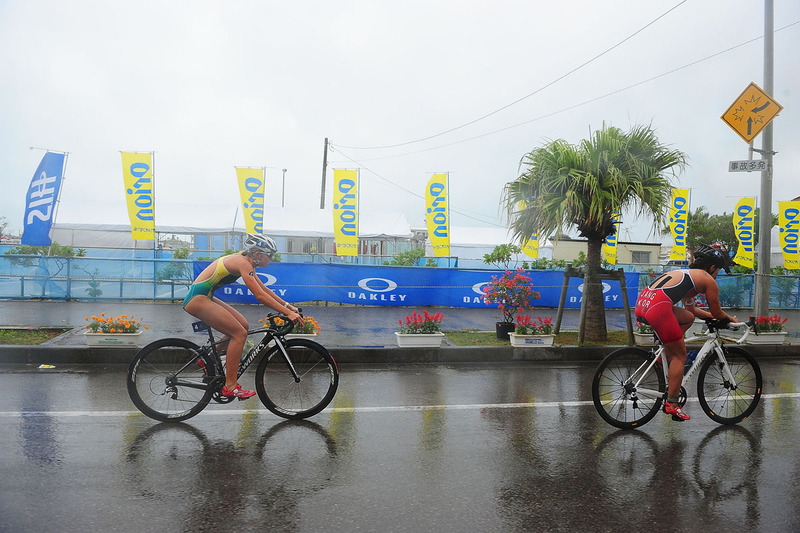 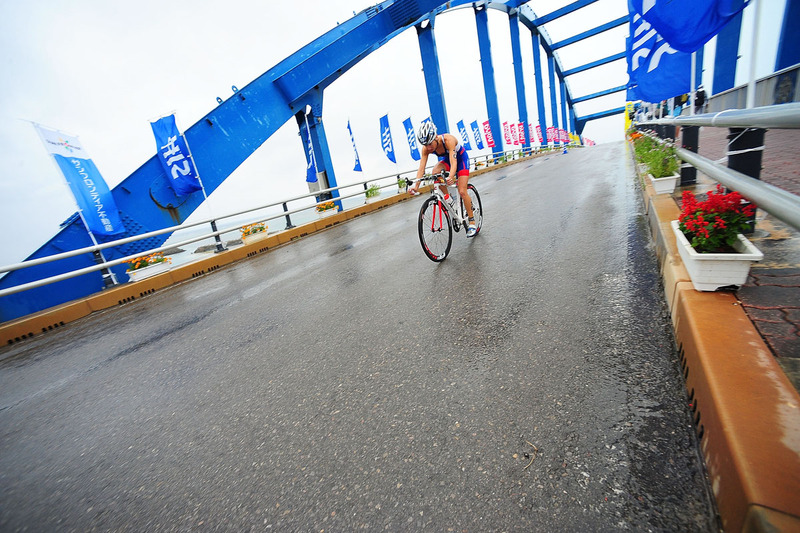 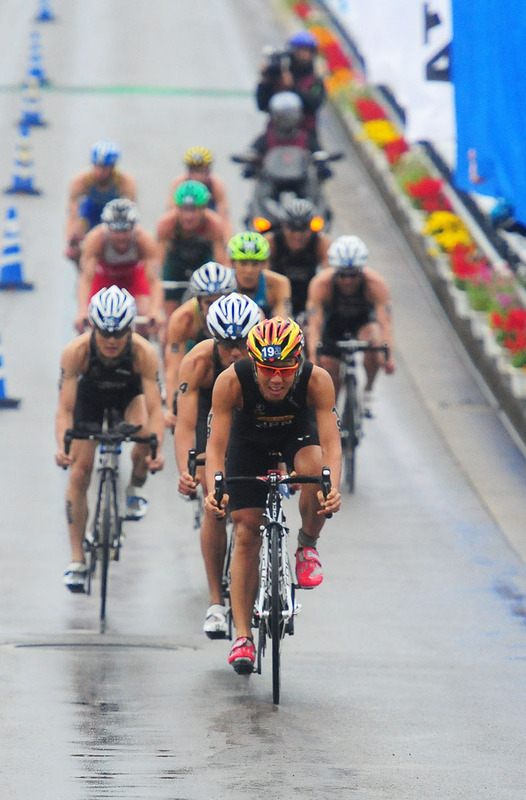 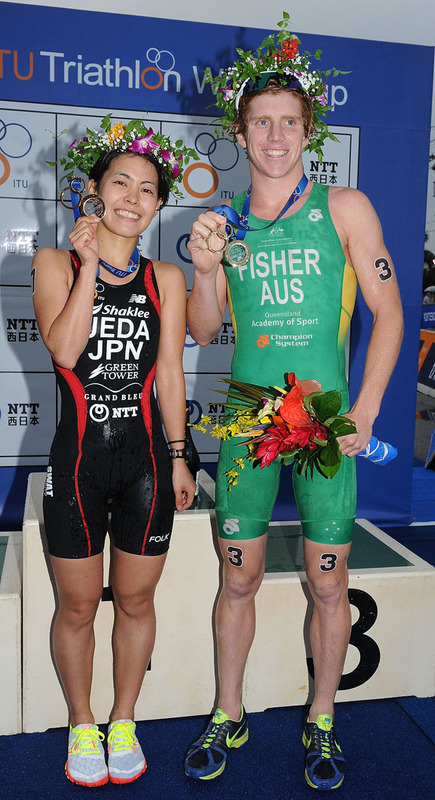 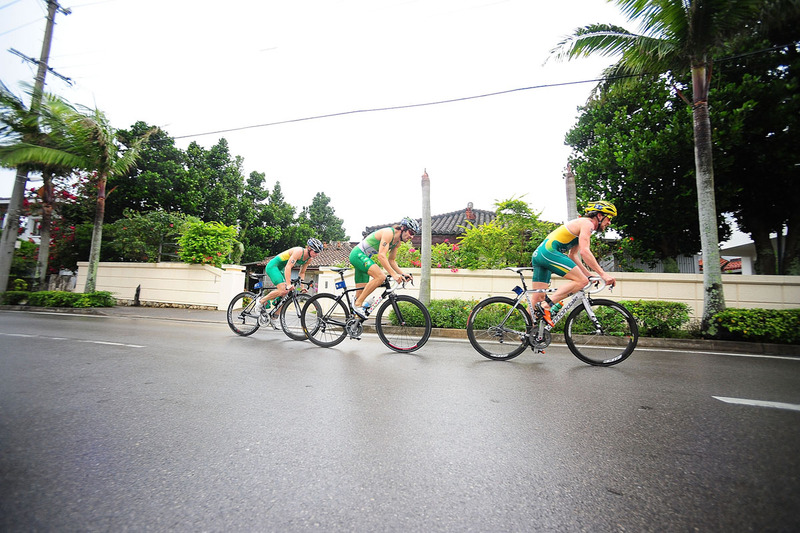 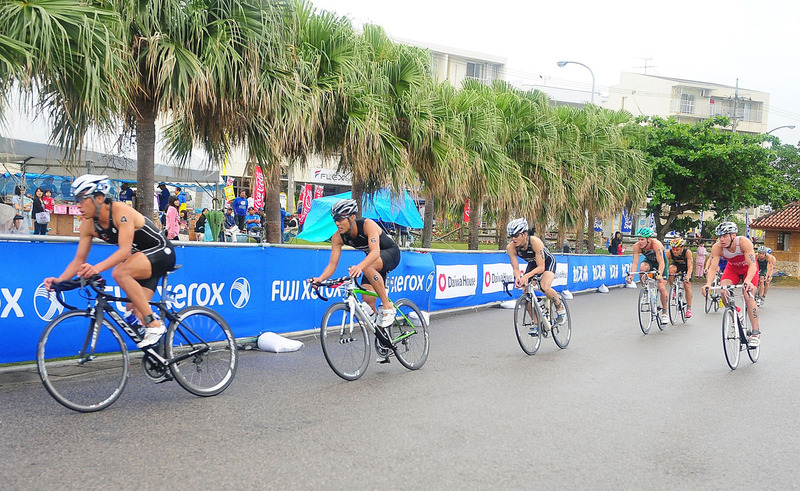 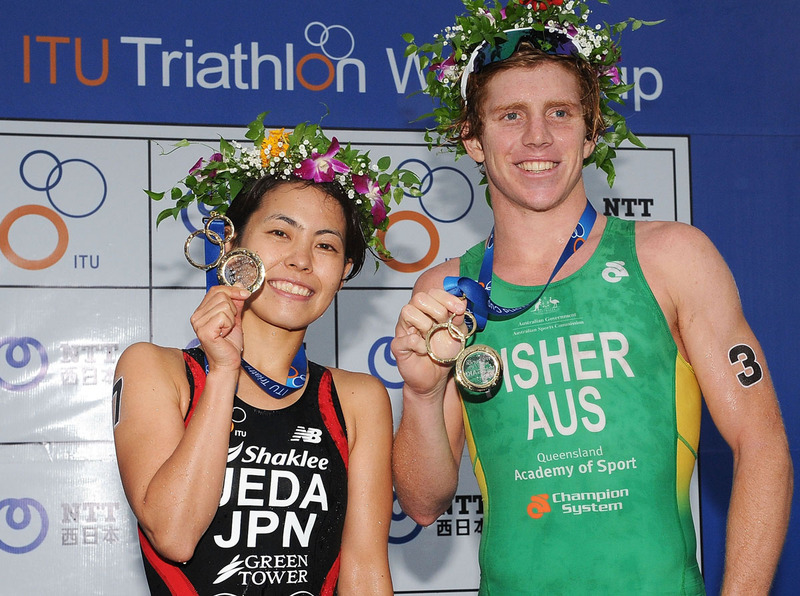 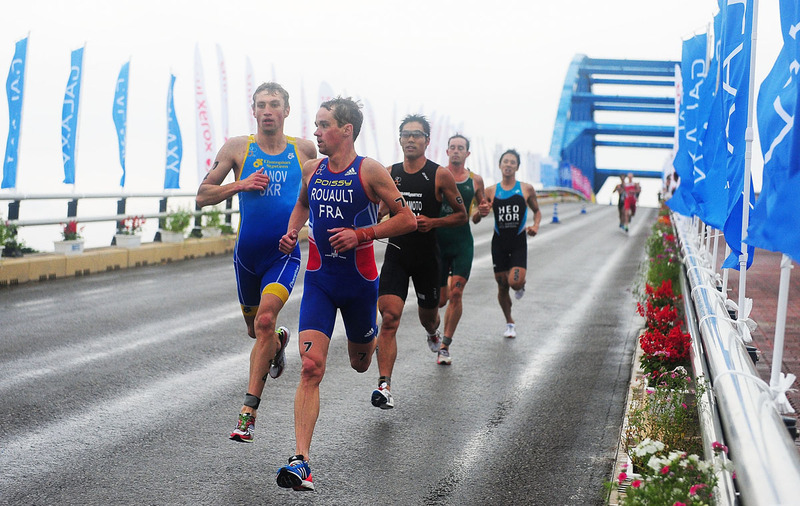 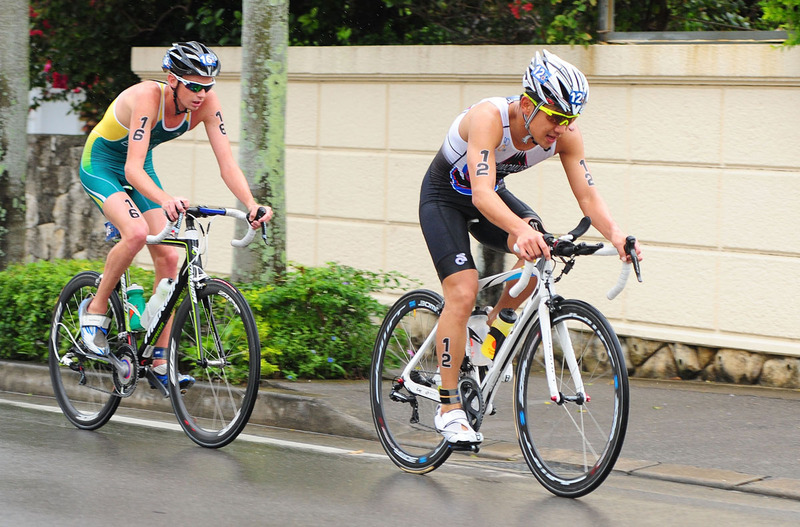 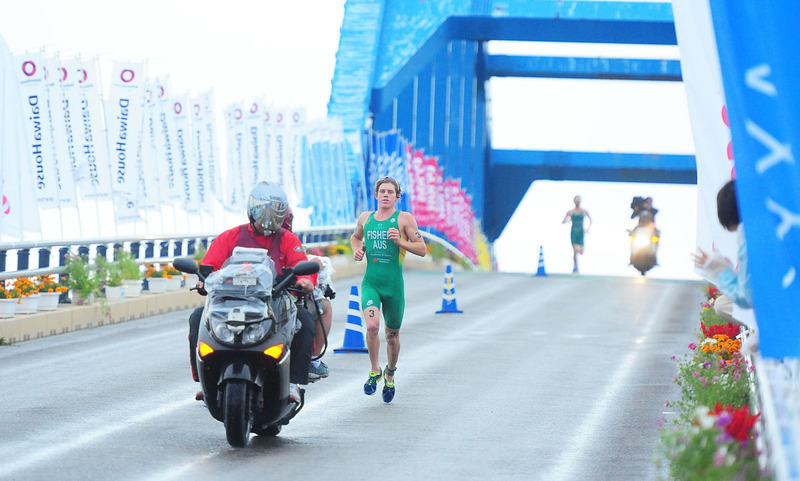 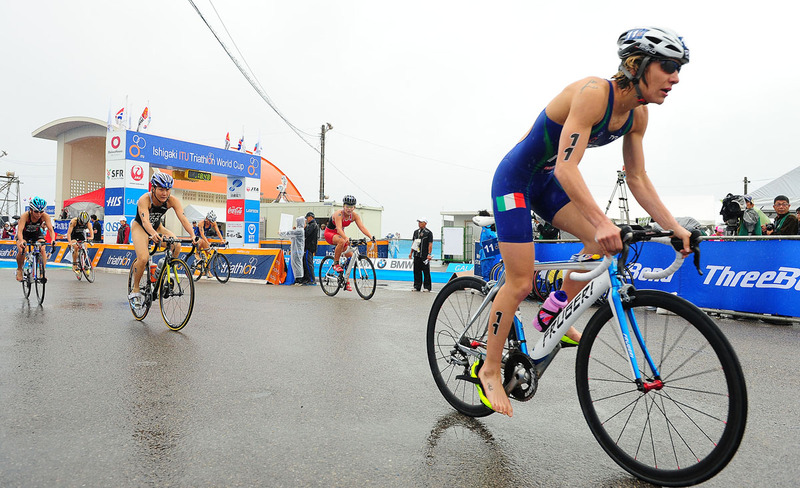 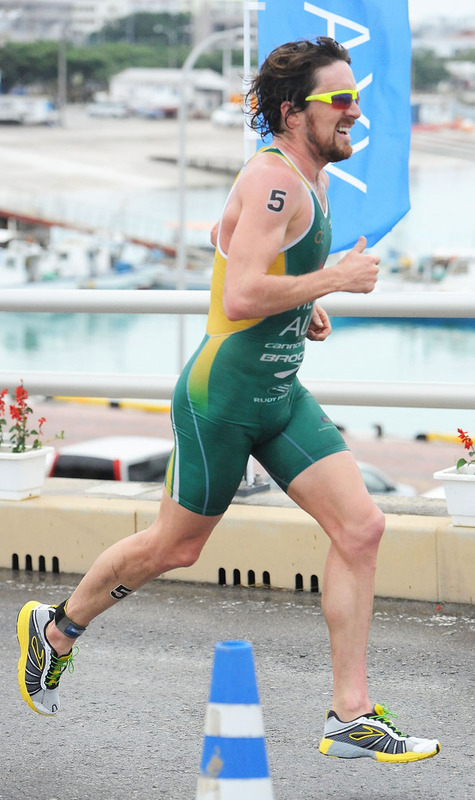 Wet weather conditions couldn’t keep Ryan Fisher (AUS) from storming to his first ever World Cup title in Ishigaki with a monster performance on the bike and run courses. 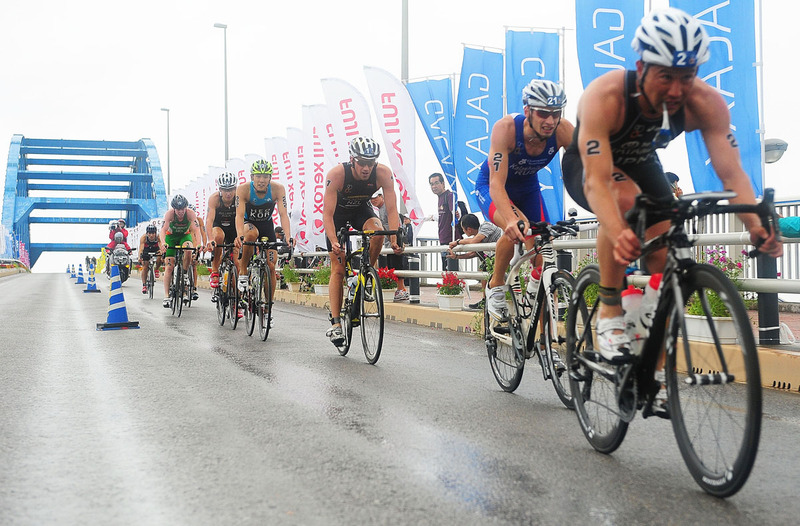 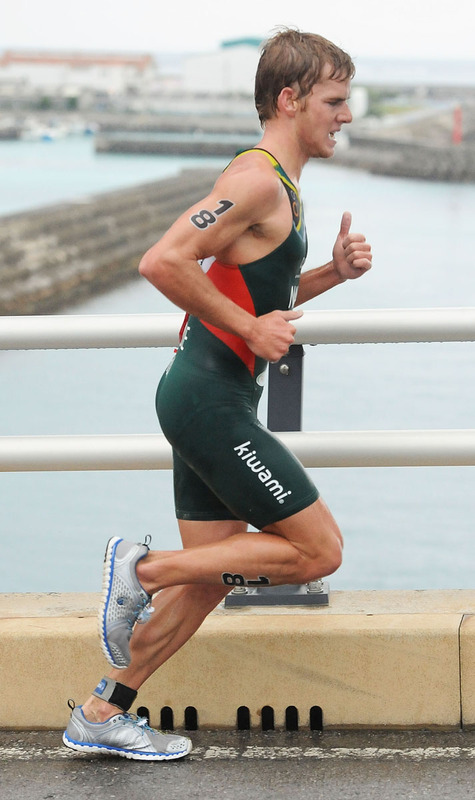 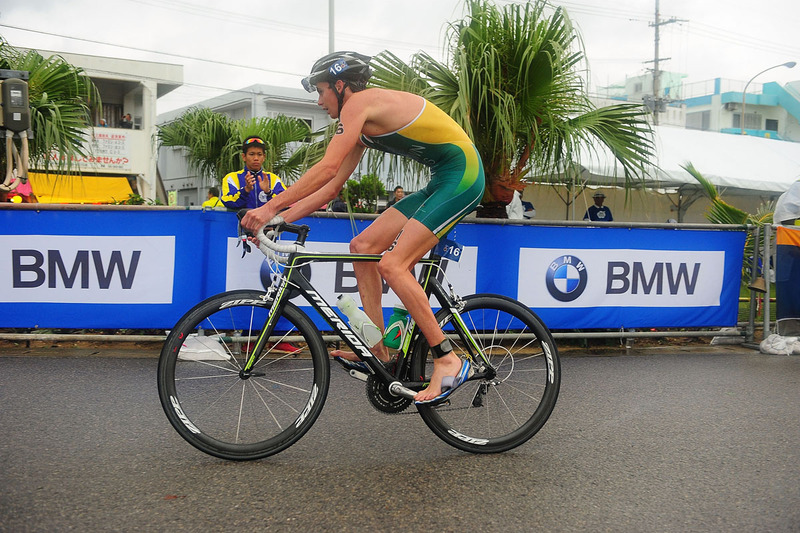 The rising star capitalized on a breakaway with fellow countryman Dan Wilson on the bike before he attacked on the run to claim his first major ITU title. 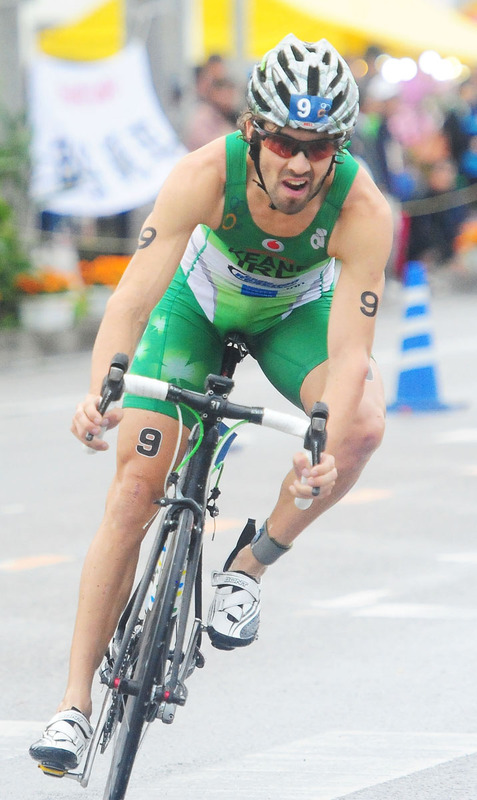 Bryan Keane (IRL), who attempted to stay with Fisher on the bike breakaway until he crashed in the final laps, clocked the fourth fastest run split of the day to come from behind for silver. 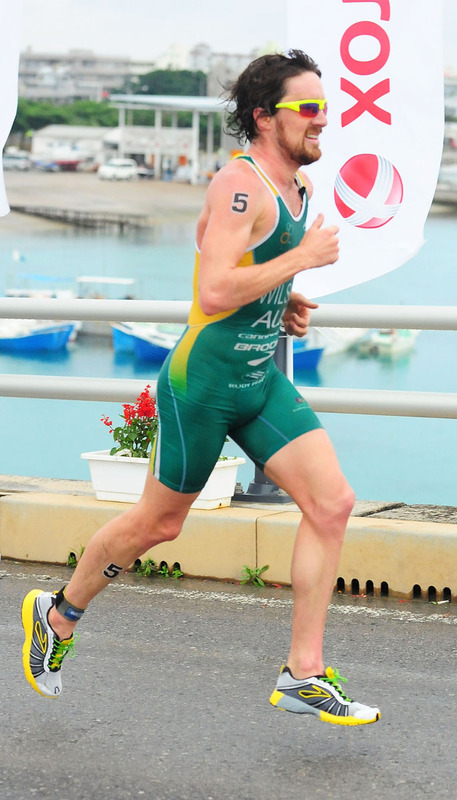 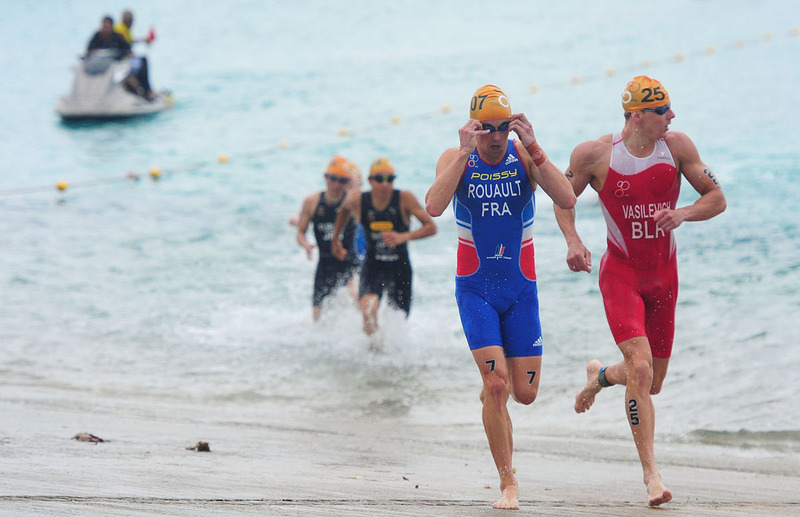 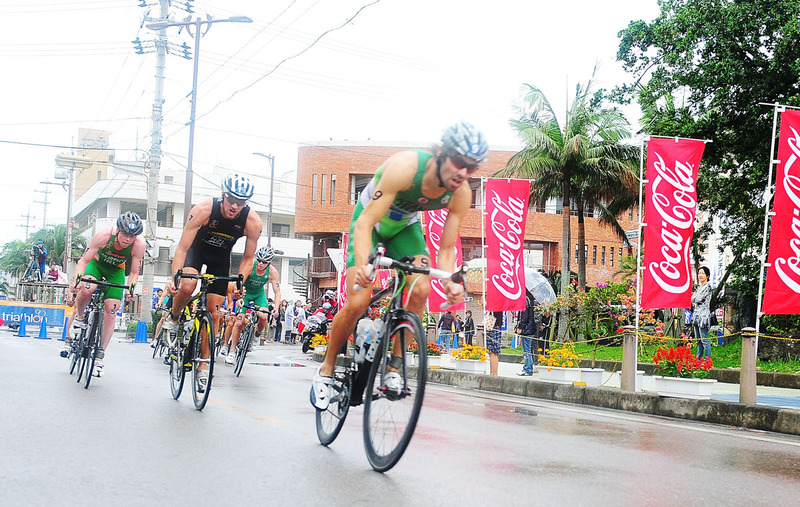 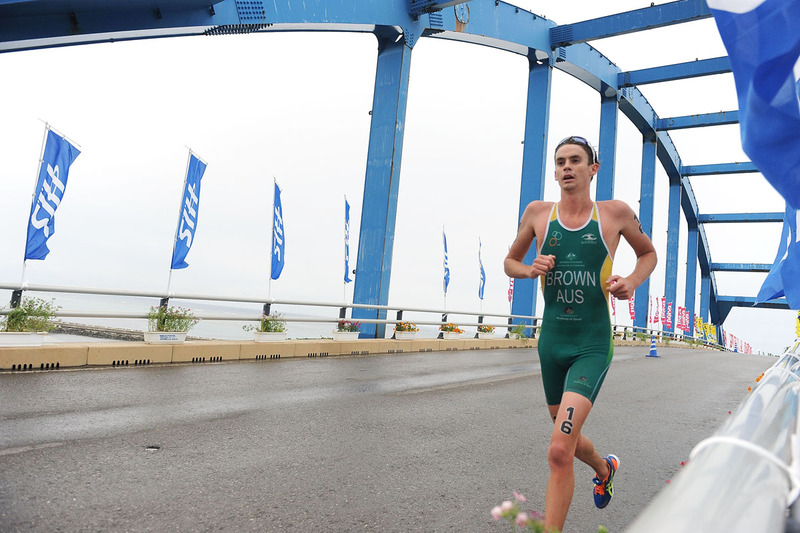 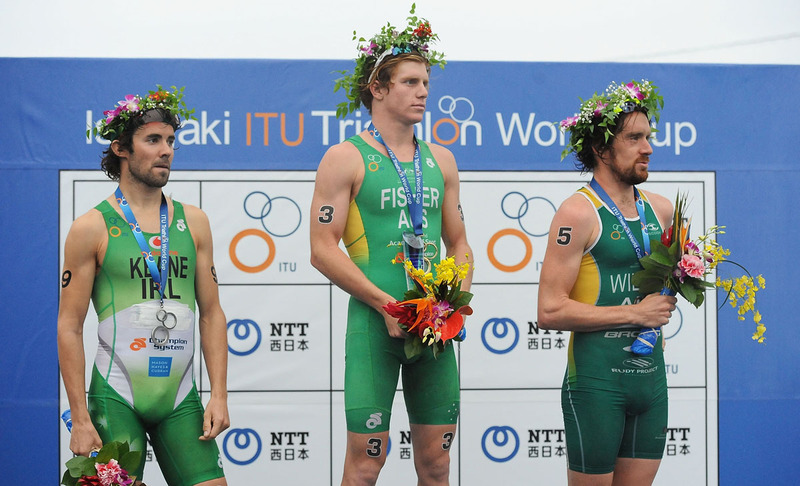 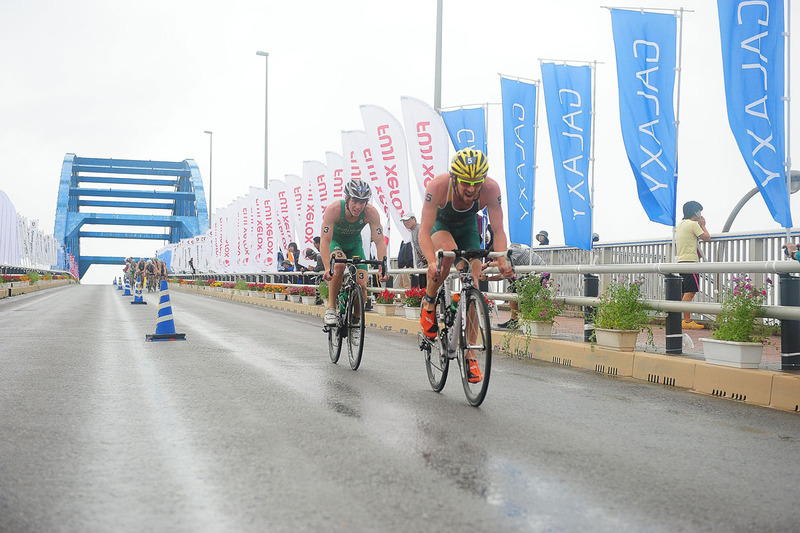 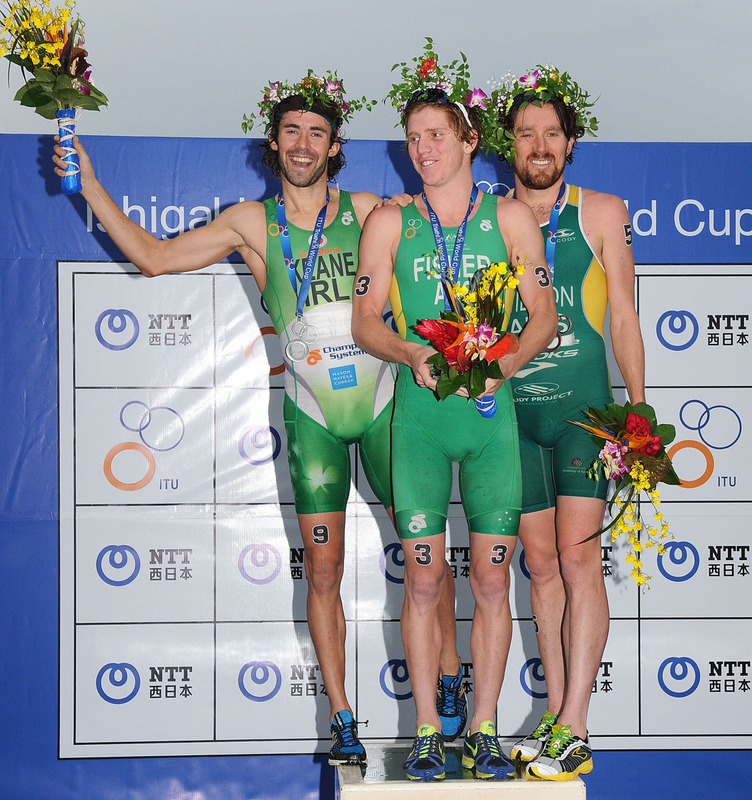 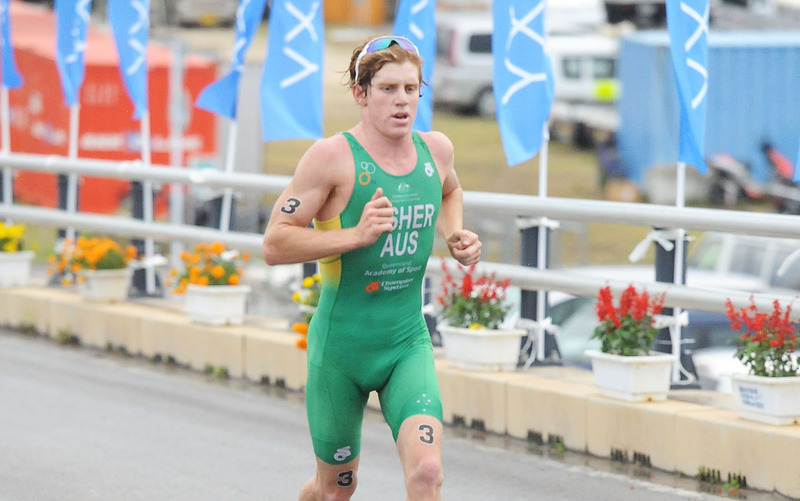 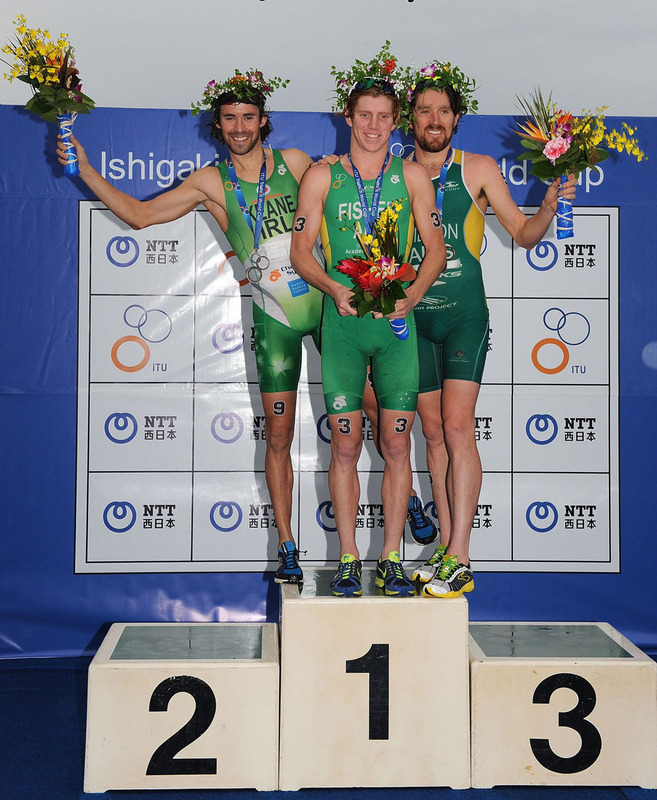 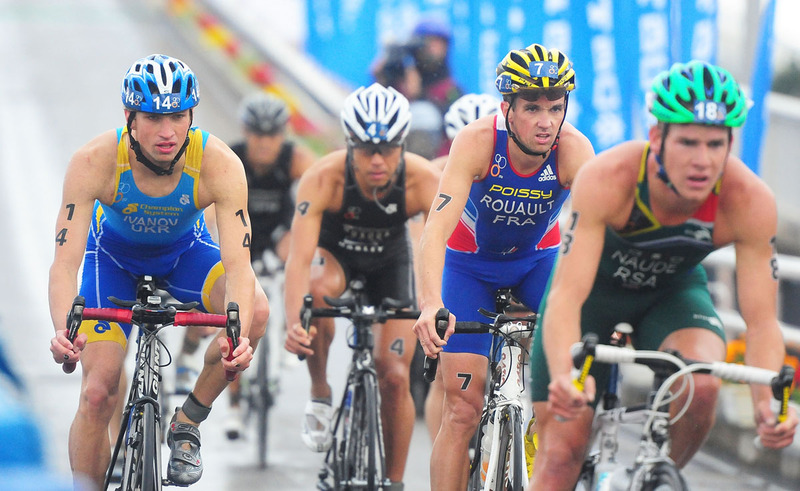 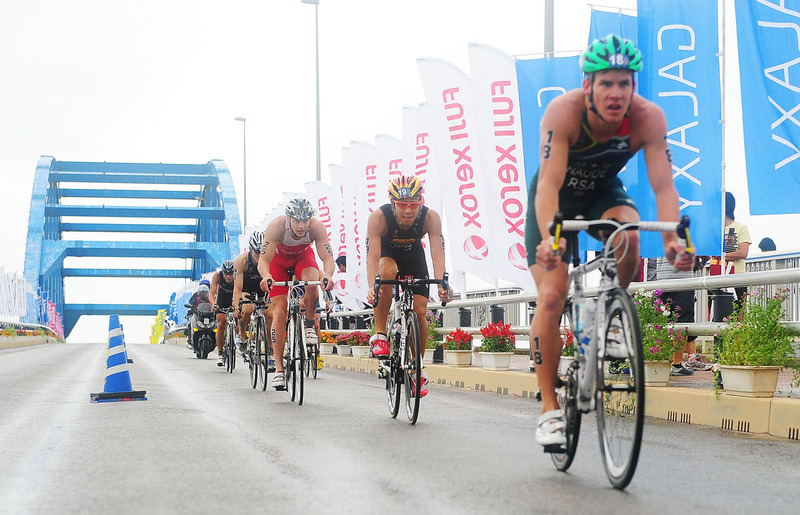 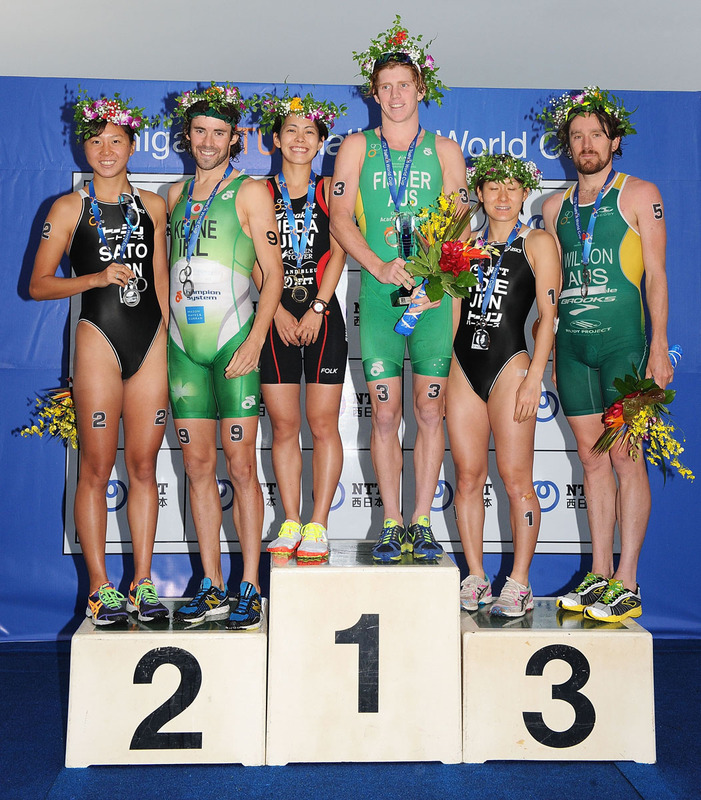 After going into the run in prime podium position, Dan Wilson (AUS) held strong for bronze. 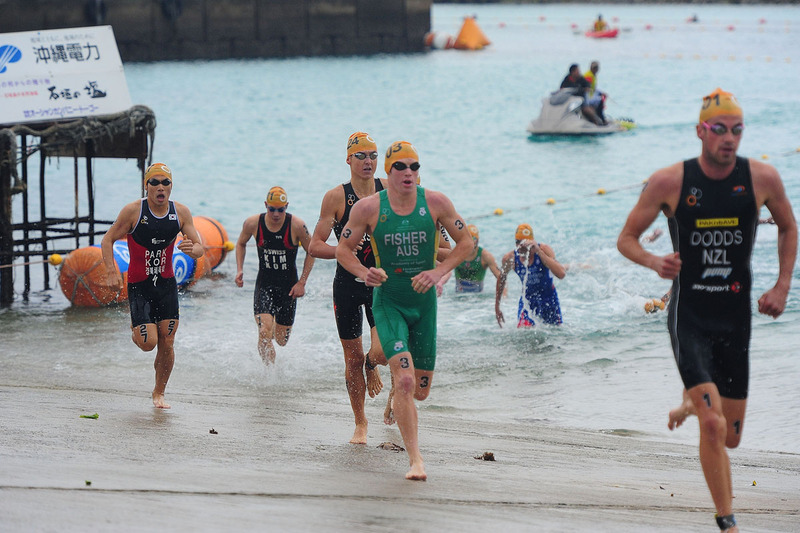 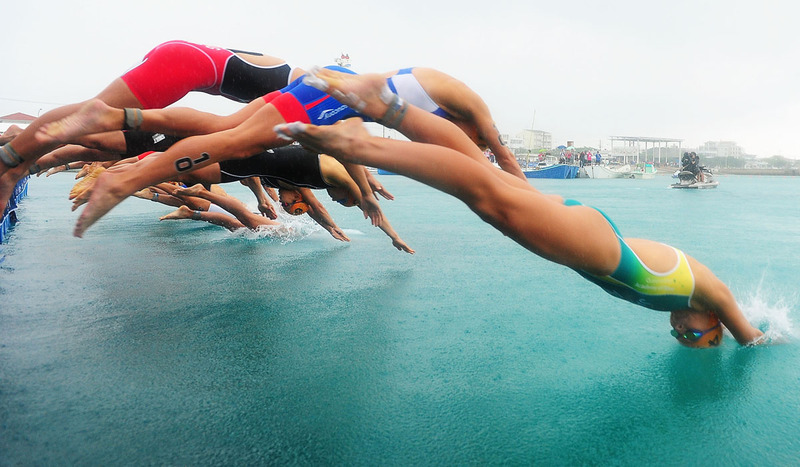 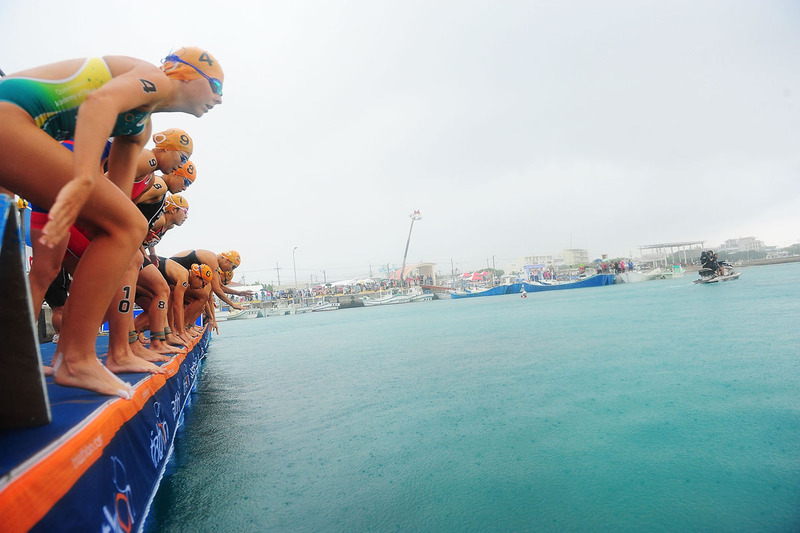 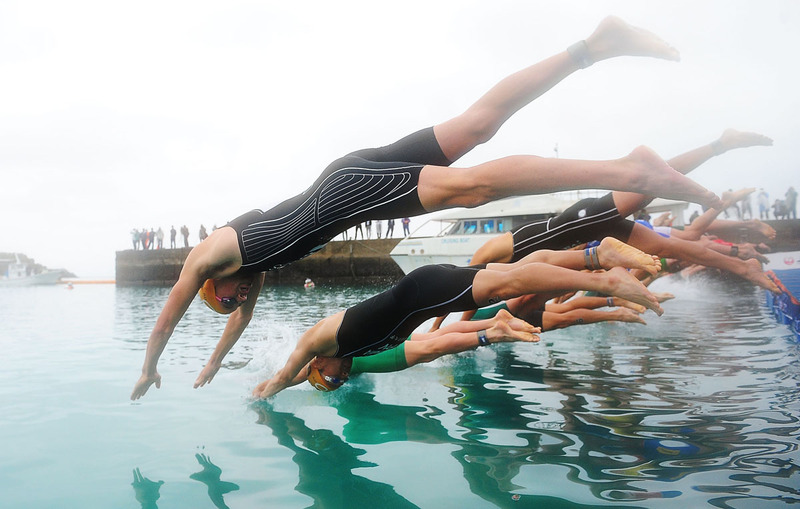 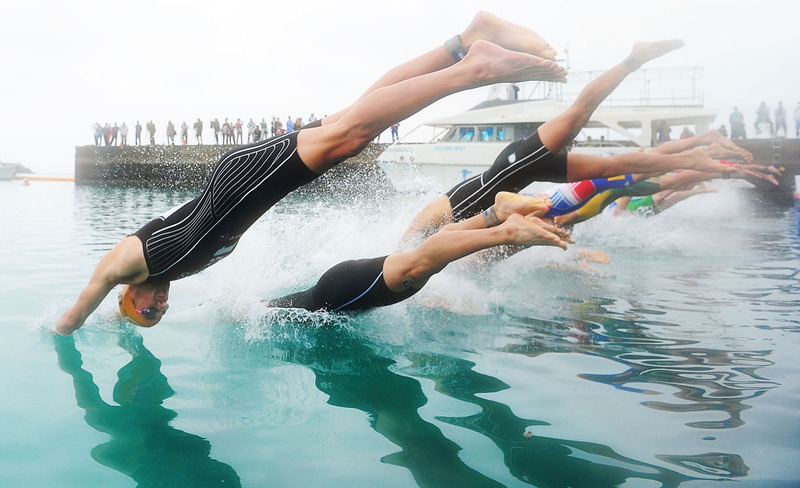 The men’s competition got off to a congested start, with Wilson leading a 15-man group out of the water within 14 seconds of each other. 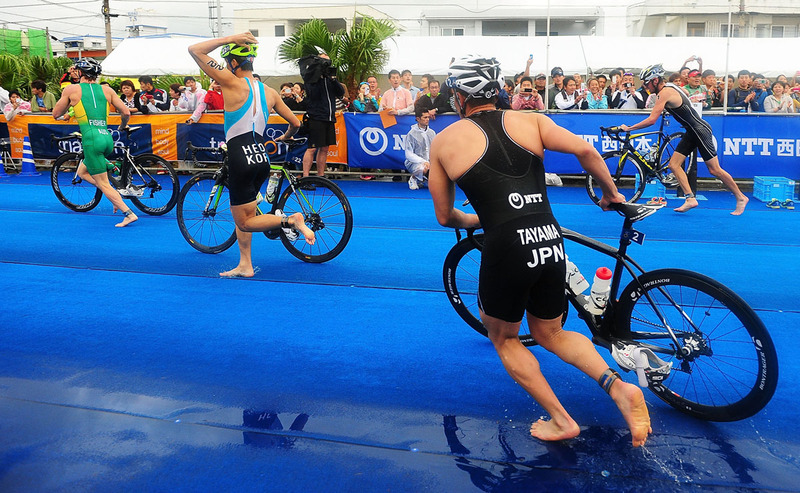 Korea’s Jung Min Park and Min Ho Heo were right on his feet, followed by Fisher. 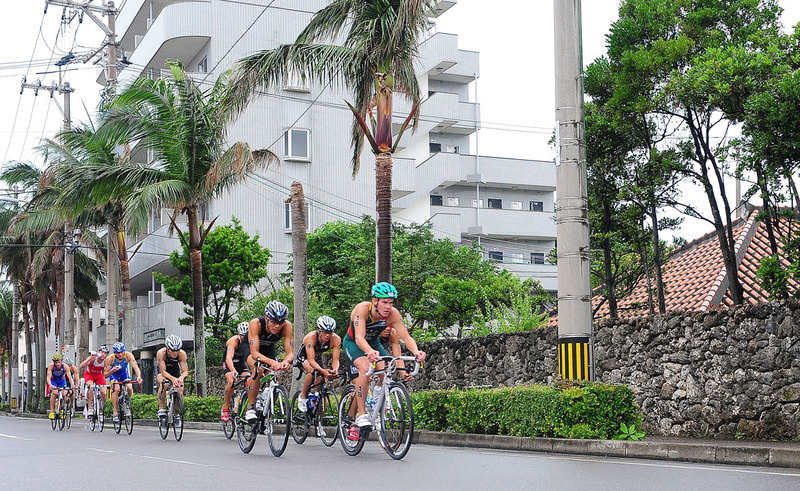 Early on the bike, the men split into three groups, with 12 leaders out front on the first lap. 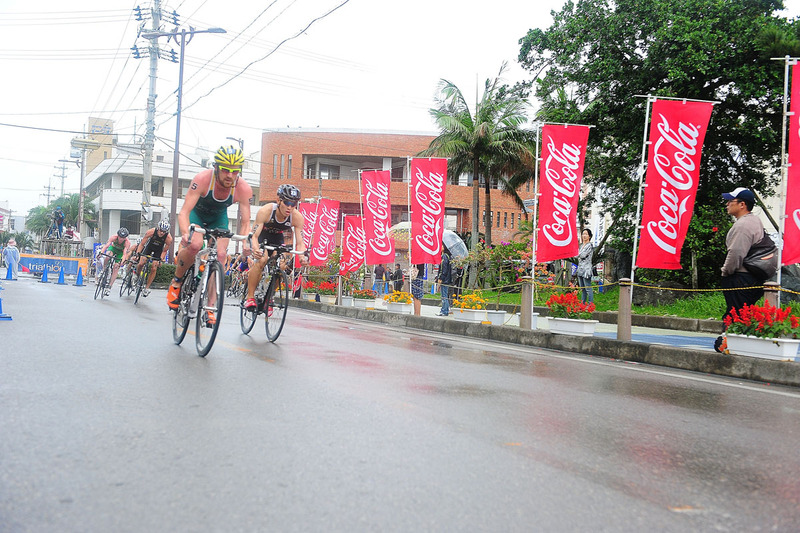 However, athletes dropped quickly, with the group dwindling down to 11 by the first lap and the chase group 30 seconds back. 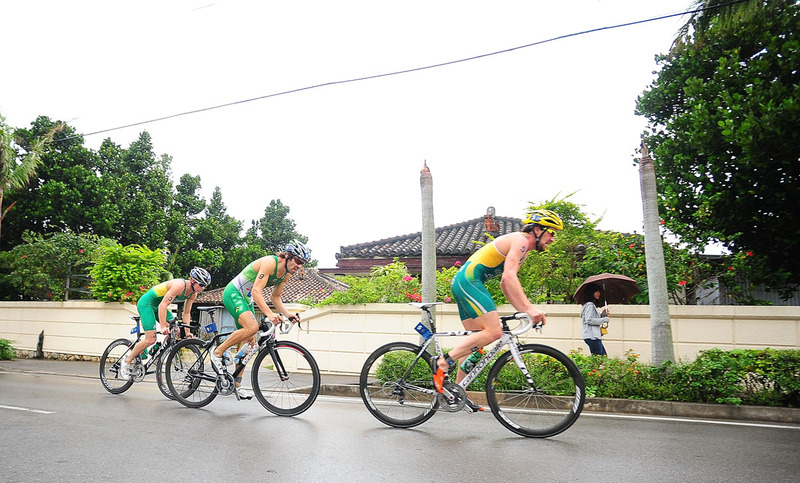 Pre-race top contenders Fisher, Keane, Tony Dodds (NZL) and Yuichi Hosoda (JPN) led, making it a challenge for the chase group to bridge up. 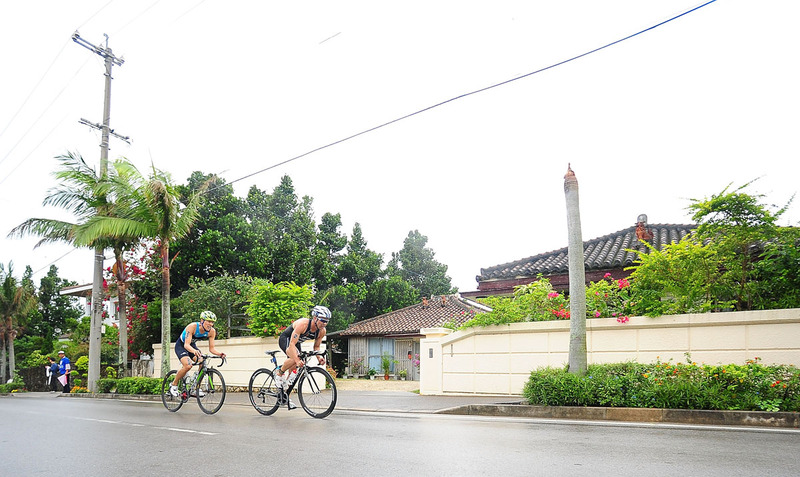 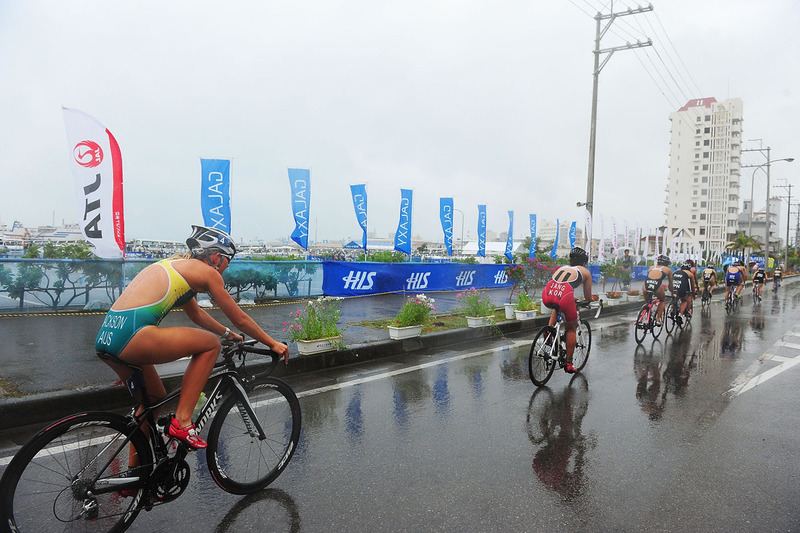 After a crash forced Dodds and Ju Seok Kim out of the race, Wilson, Keane and Fisher took advantage of the the situation and established a breakaway on the third lap, leaving Min Ho Heo and Hirokatsu Tayama (JPN) to ride solo. 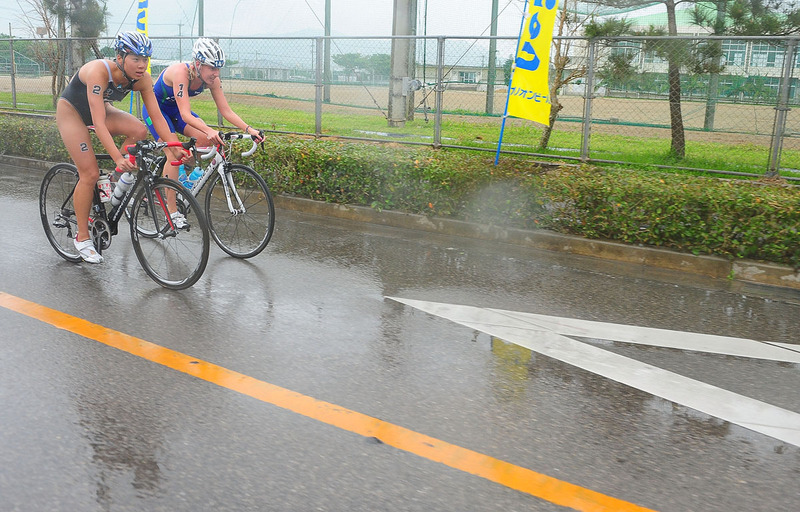 Meanwhile, the remaining men joined the 12-man chase group. 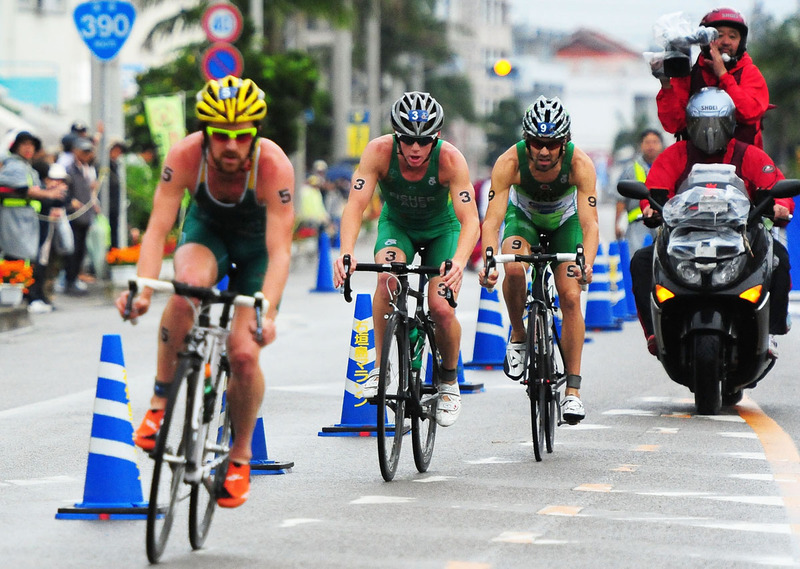 By the fifth lap, the leading trio increased their lead to 50 seconds before Fisher and Wilson again took advantage after Keane crashed, losing him valuable time. 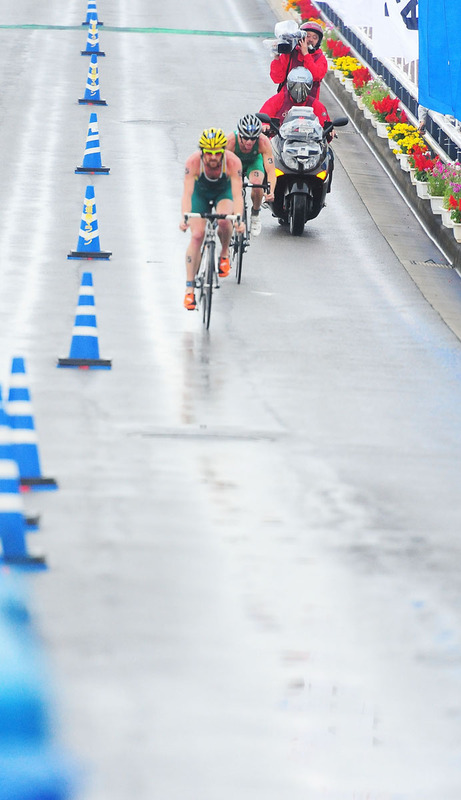 The Irishman was then left to ride on his own for the final laps, frantically working hard to bridge the gap to the Aussies, but still held nearly two minutes over the third group. 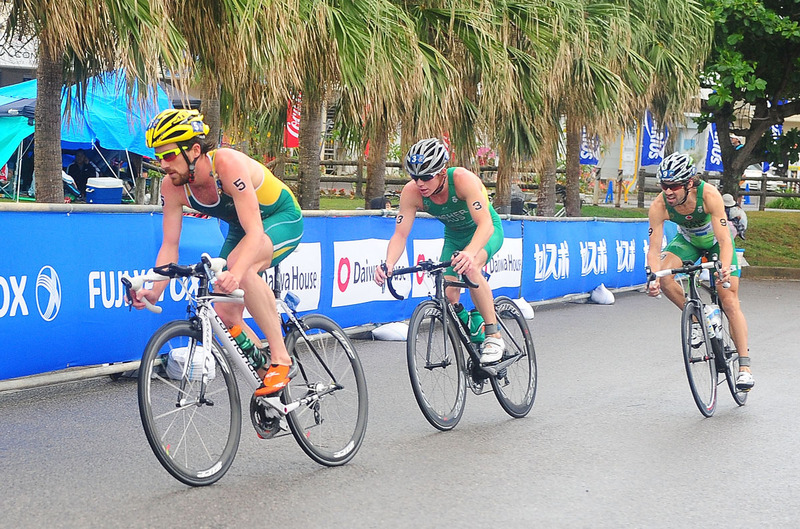 By the time the Aussies hammered for the run course, they owned more than a minute lead. 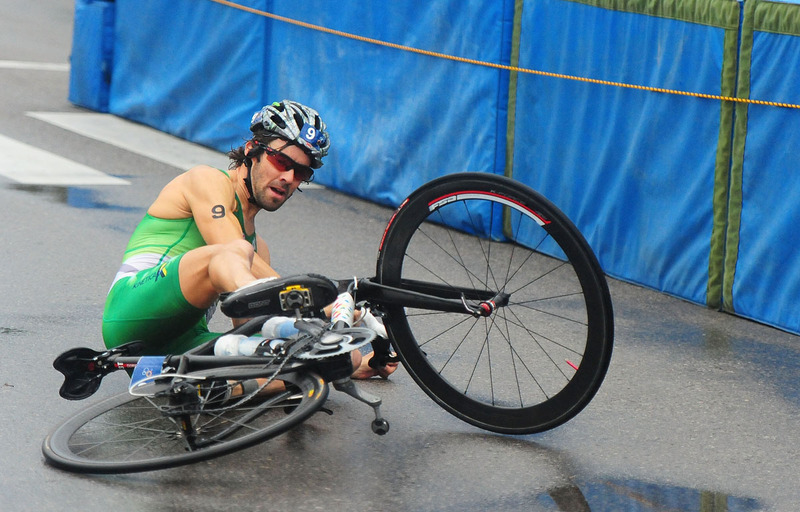 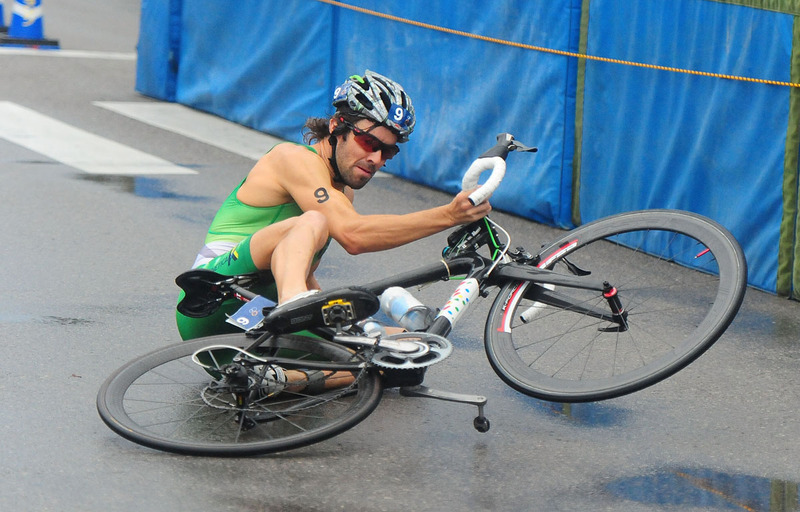 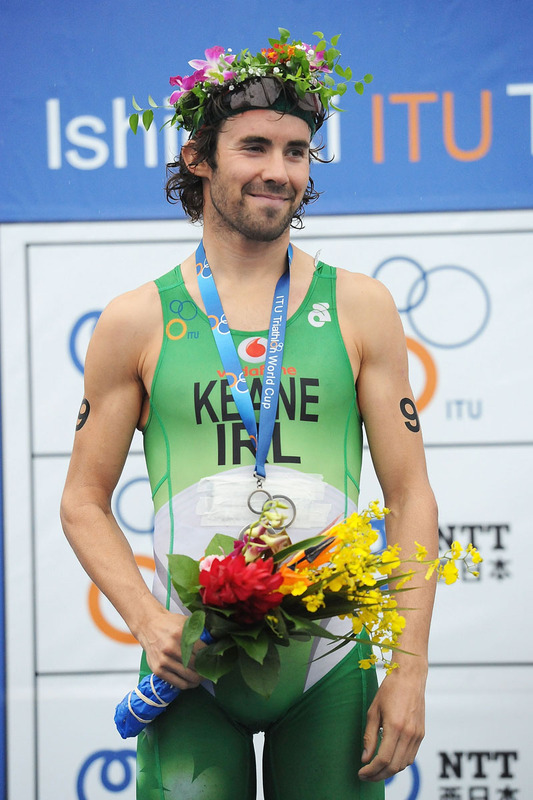 “You crash in any race your lucky to get up thankfully, it was a silly crash, I’d been careful throughout the race and came down 3 laps to go so had the bones of 14km or so by myself, I was so far behind I just had to put my head down and keep chasing,” said Keane. 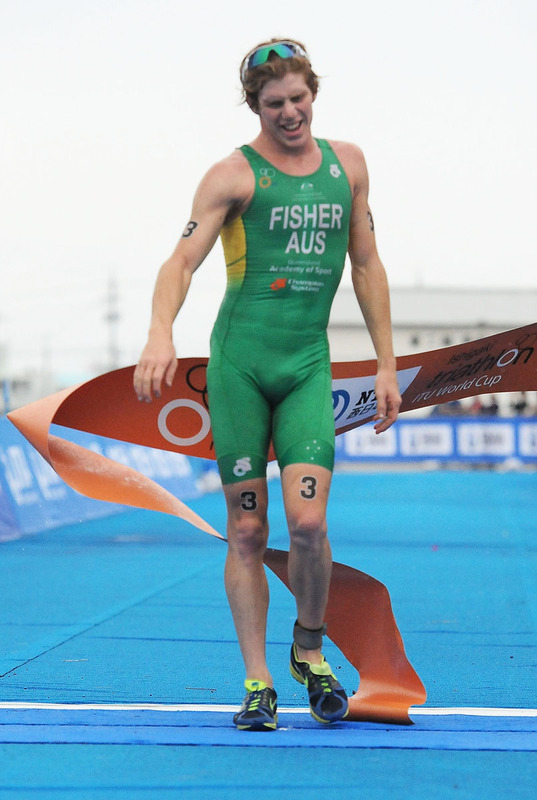 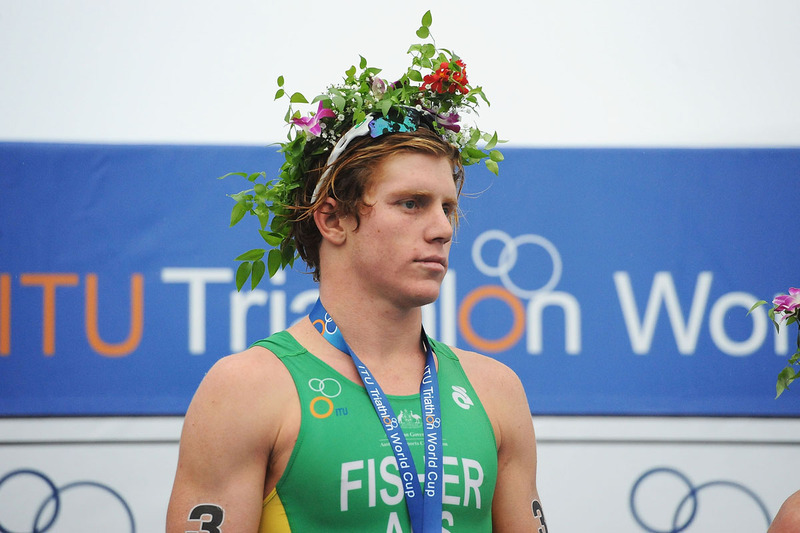 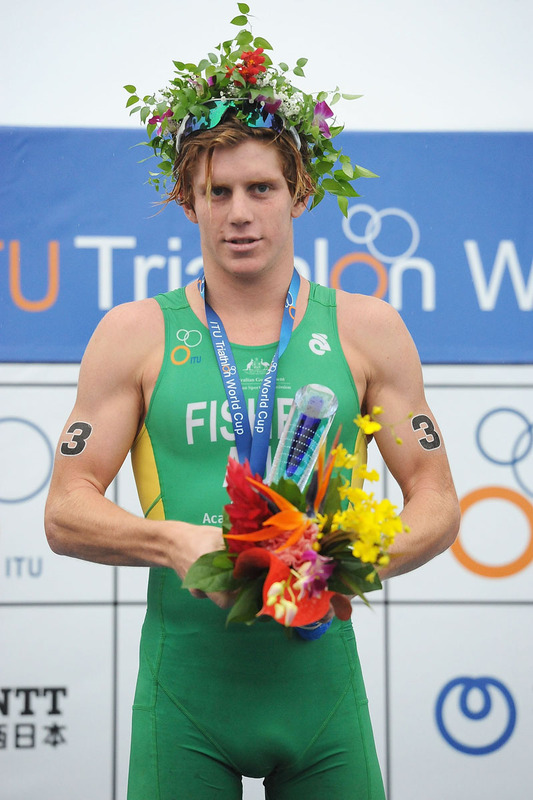 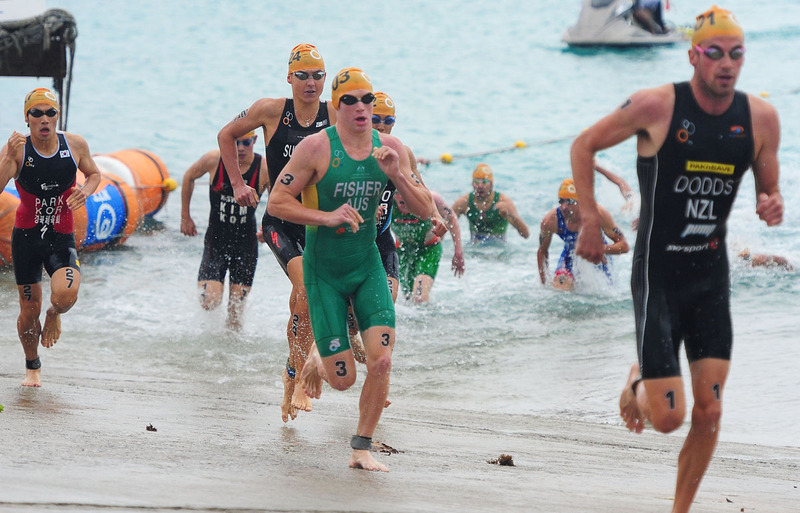 With his sights set on gold, Fisher stormed through the first 2.5km and never looked back. 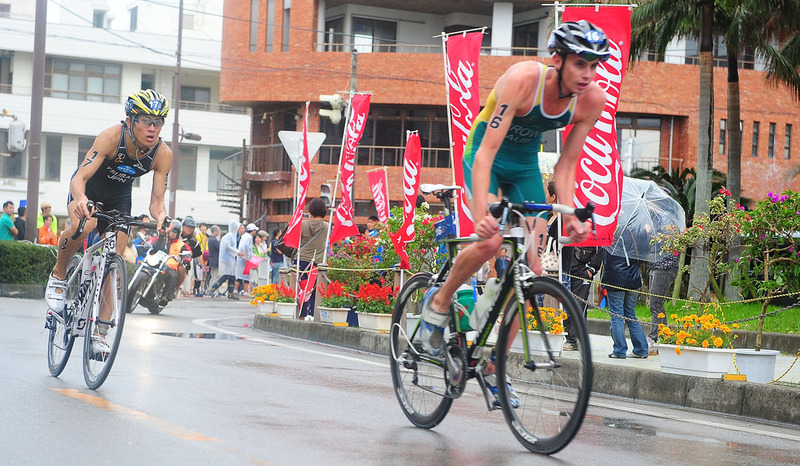 By the final lap, he extended his lead to over a minute for an easy victory in the end. 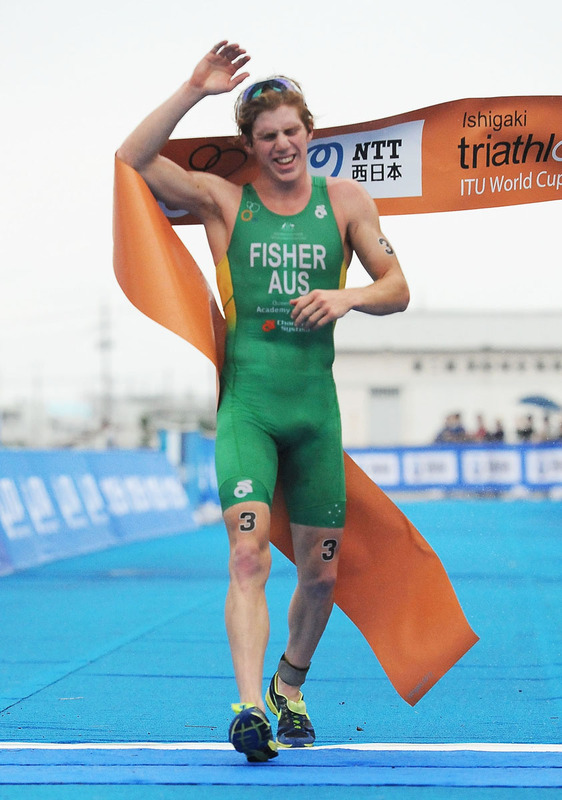 He became the seventh Aussie to win the World Cup, doing so in a time of hour, 52 minutes and 46 seconds. 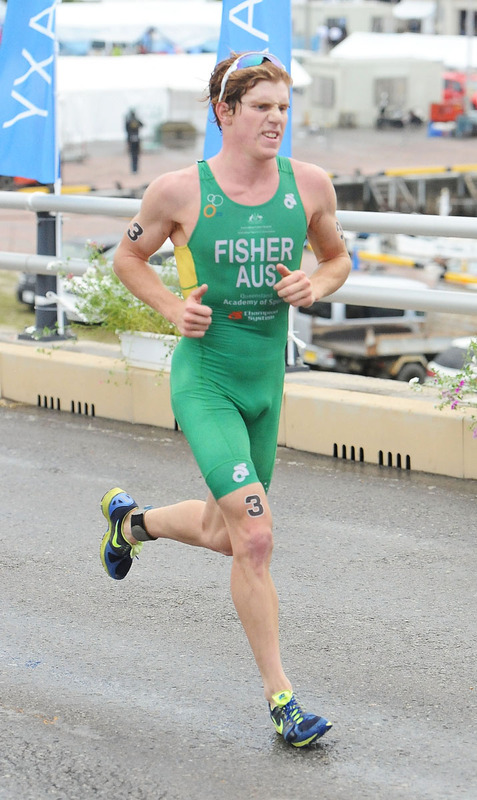 Behind Fisher, Keane labored to decrease the gap between himself and Wilson, pulling even with the Aussie with just two kilometers to go. 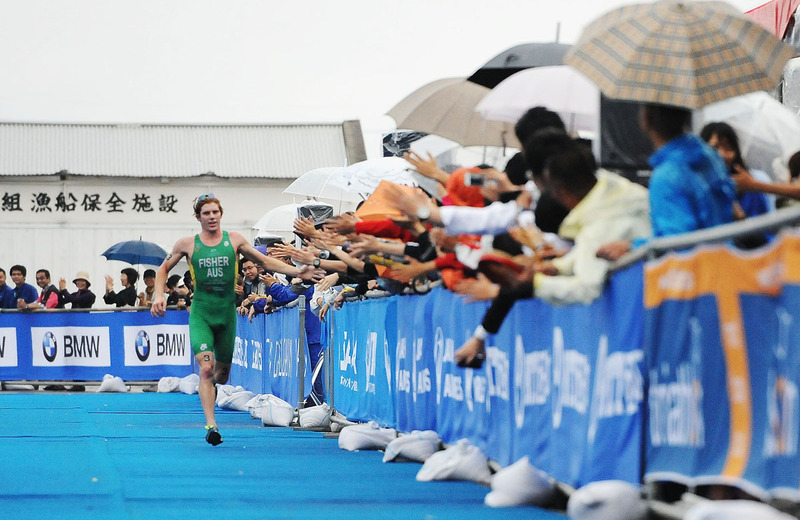 In a last-ditch effort, Keane overtook Wilson in the final stretch to earn silver in 1:53:50. 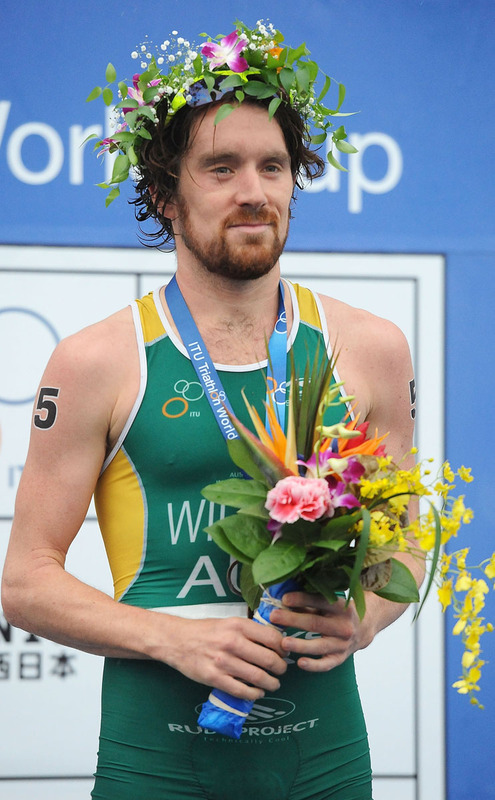 Wilson earned bronze in 1:54:02. 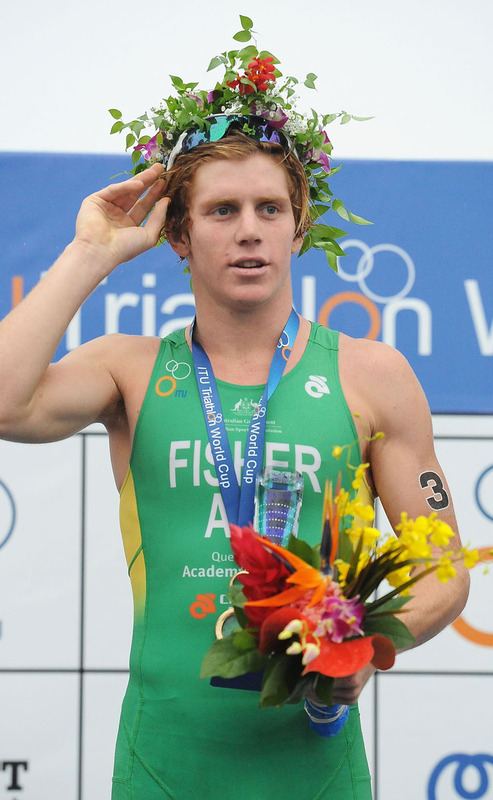 “Winning any race is good but to come here and win at a world like and it’s my first one so it’s a huge confidence booster and first real race of the season,” said Fisher. 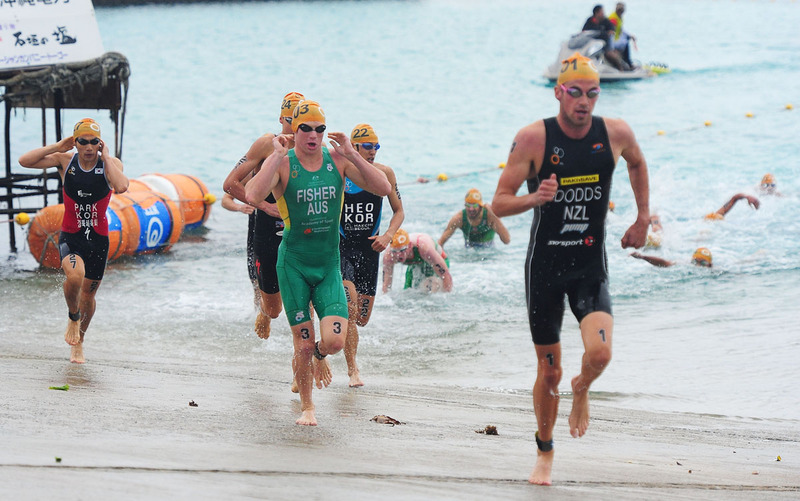 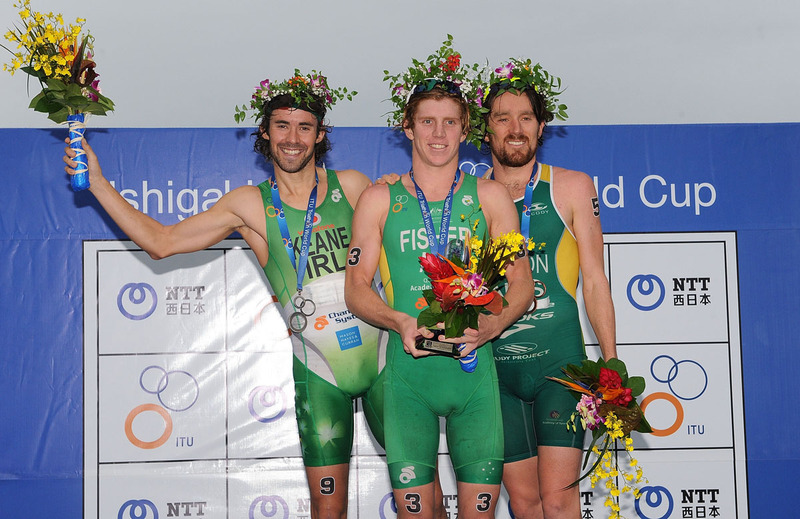 It was third time lucky for the Irishman this year after crashing out in Auckland last weekend, then just missing the podium in Mooloolaba, finishing fourth. 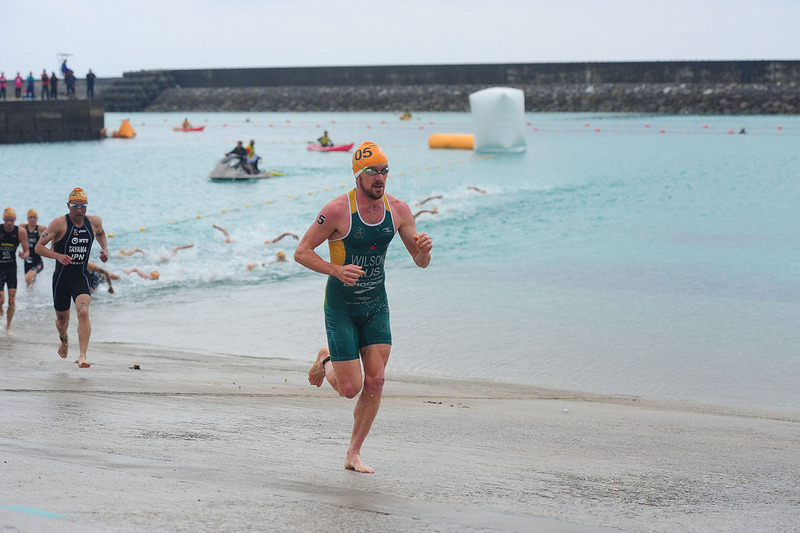 After a tough two years of frustration and injury Dan Wilson made a welcome return to international racing. 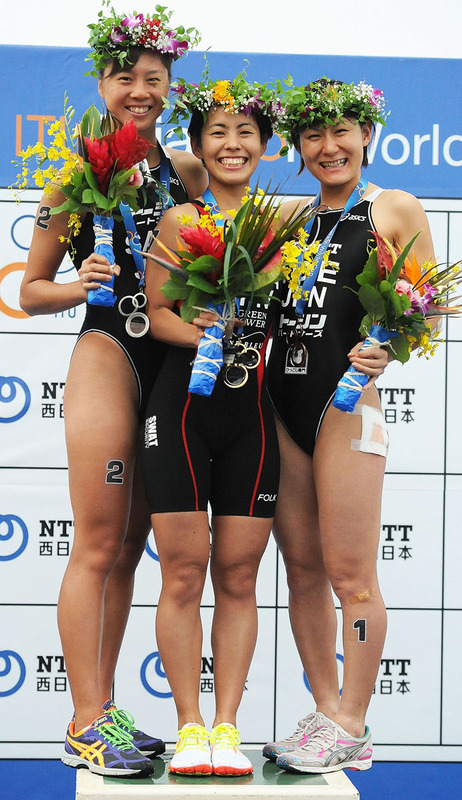 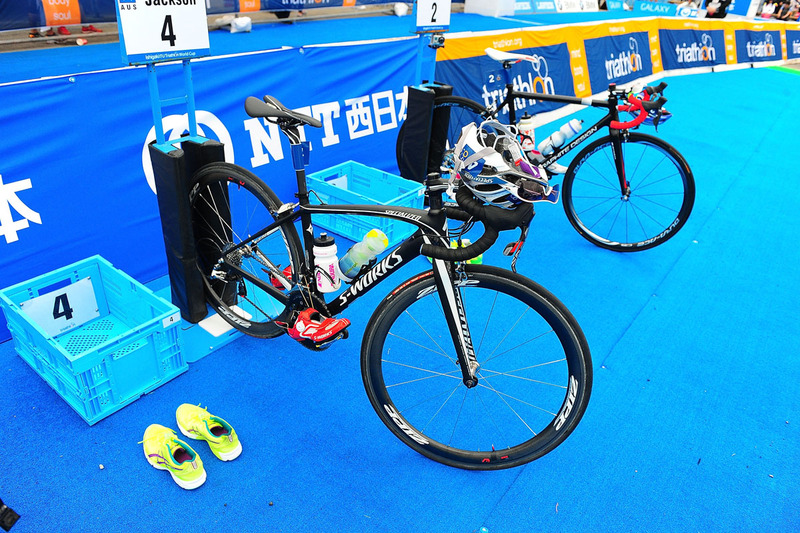 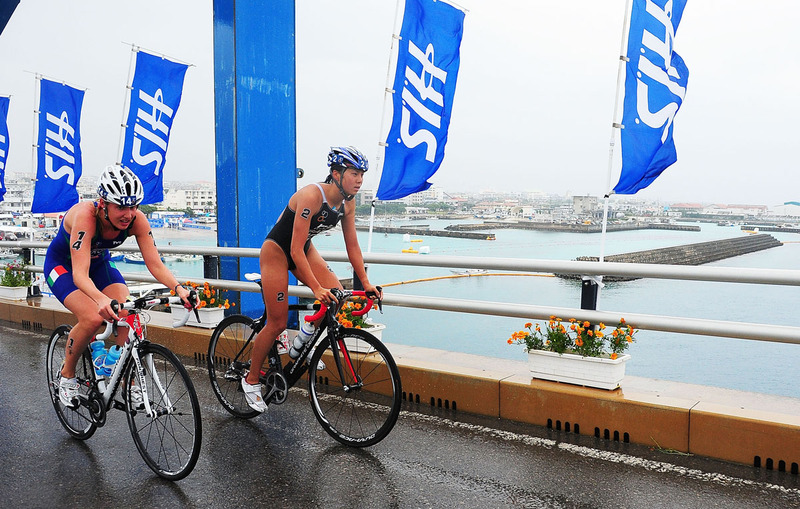 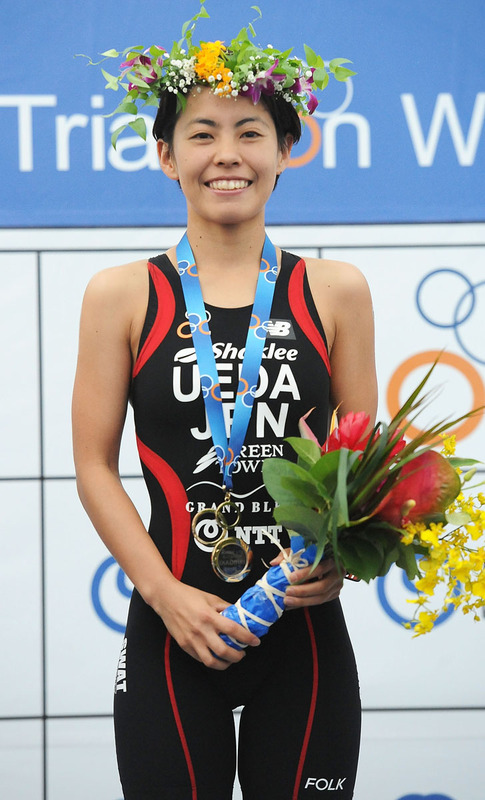 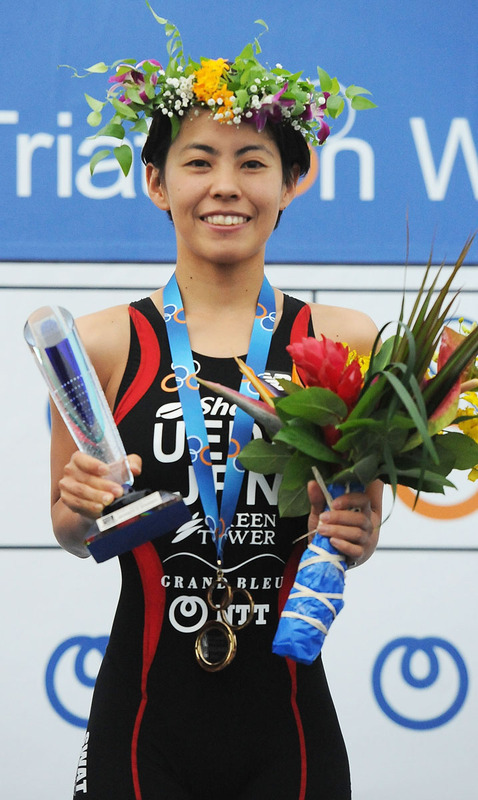 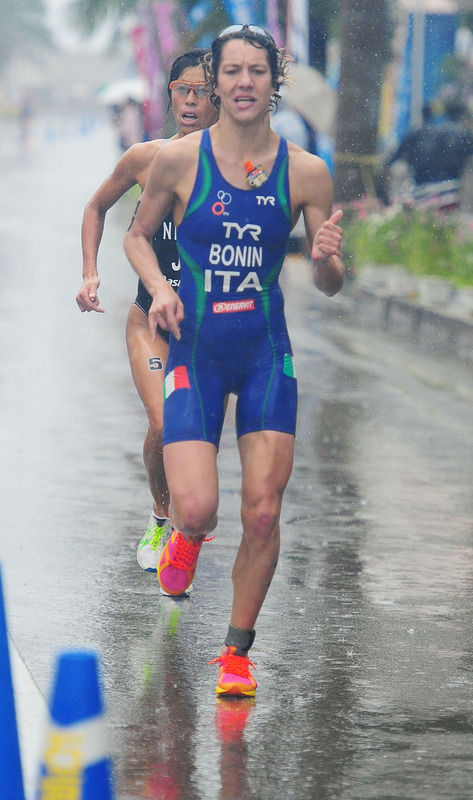 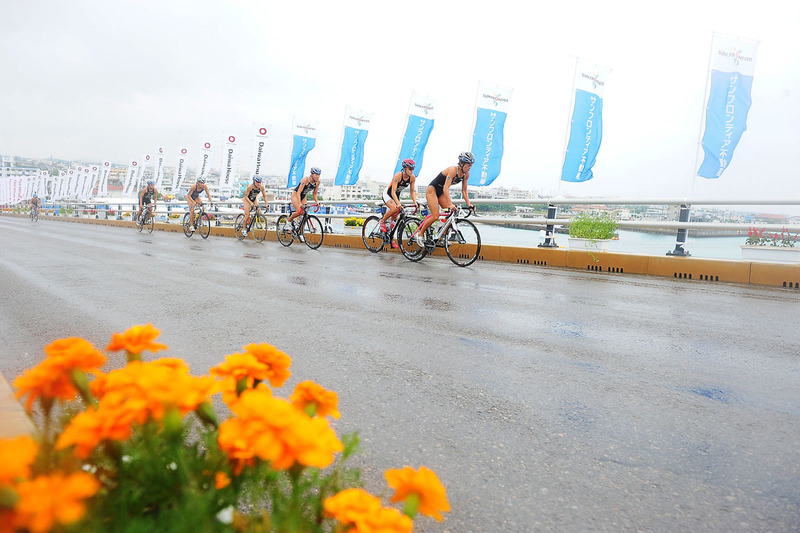 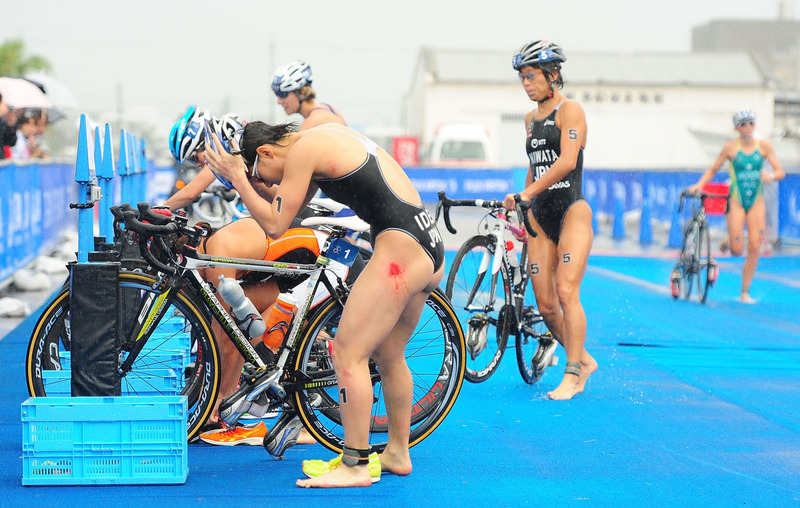 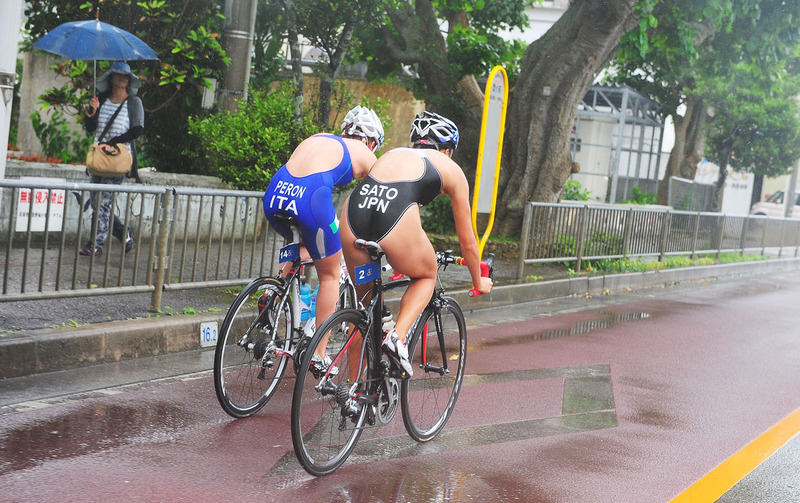 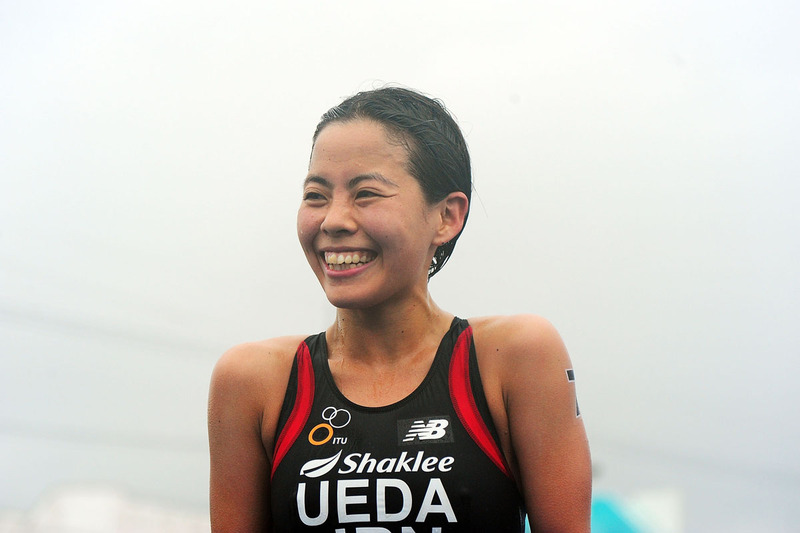 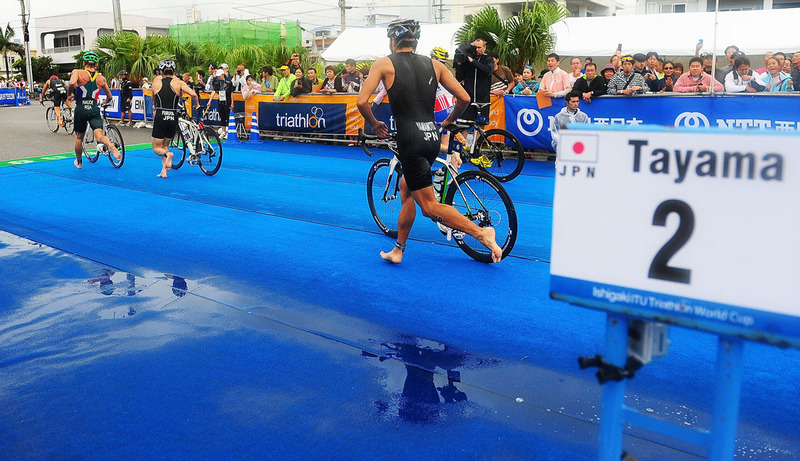 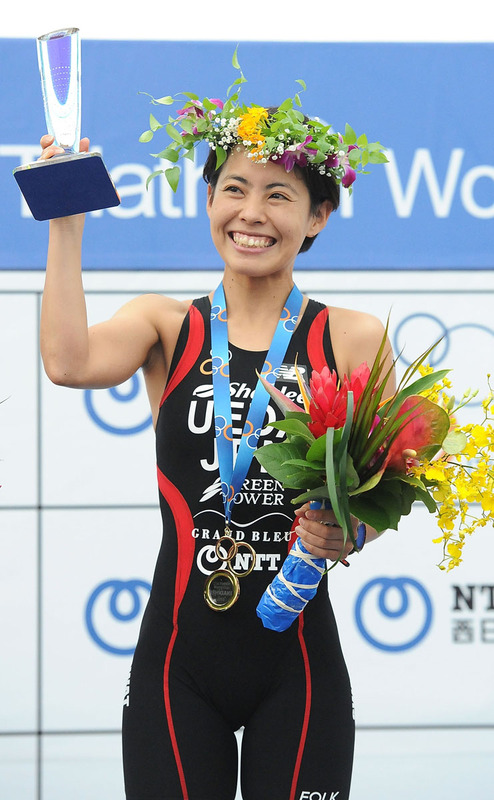 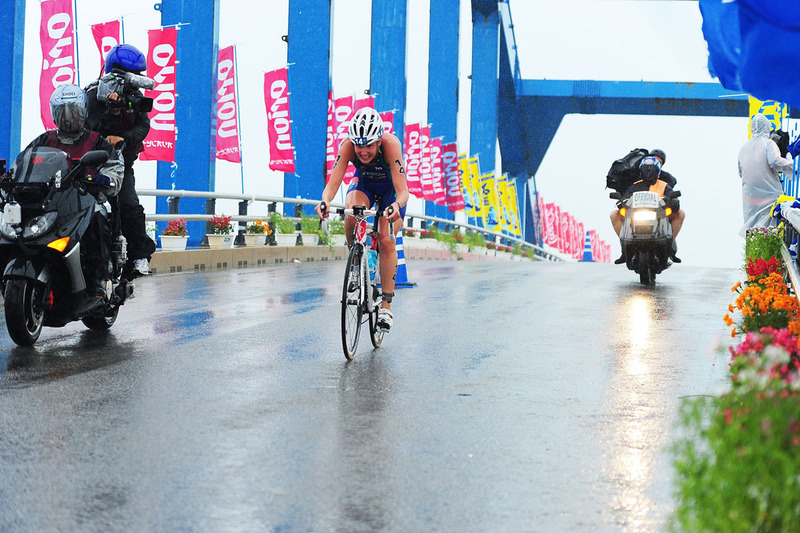 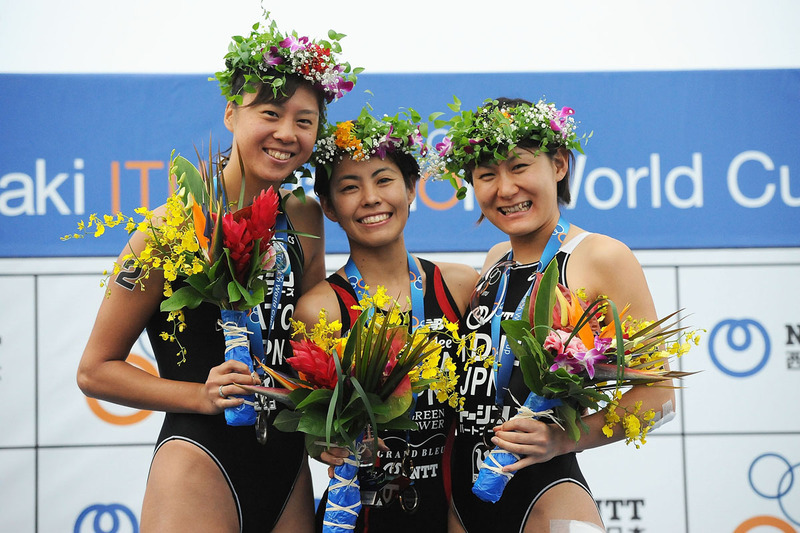 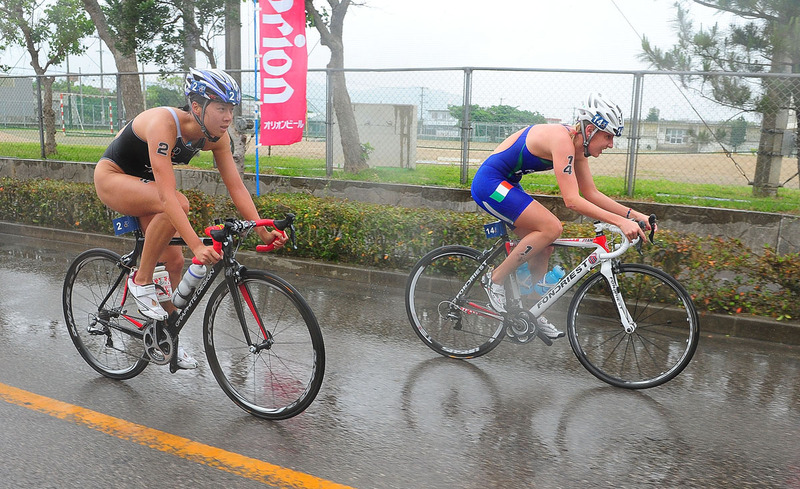 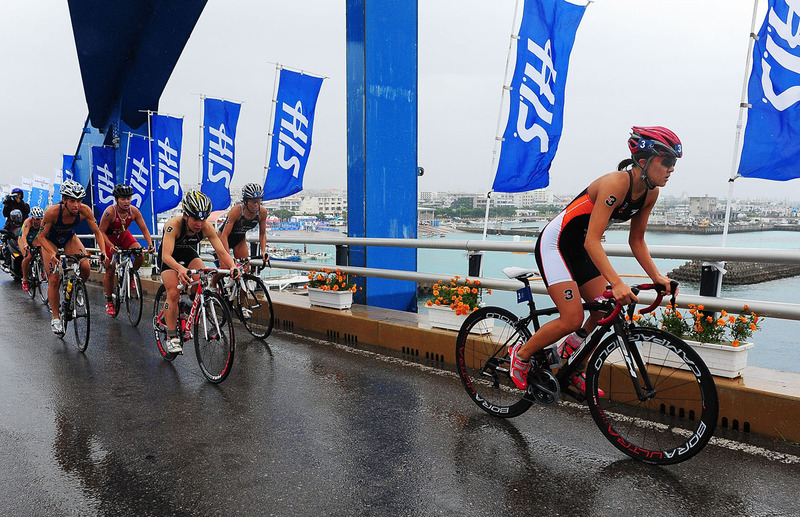 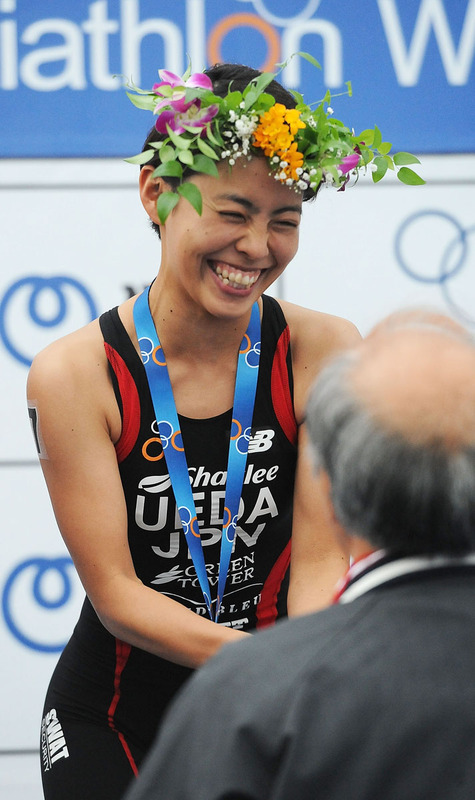 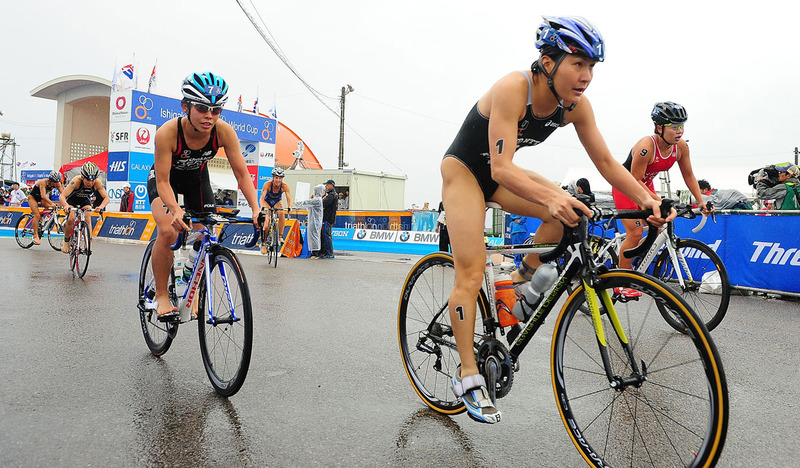 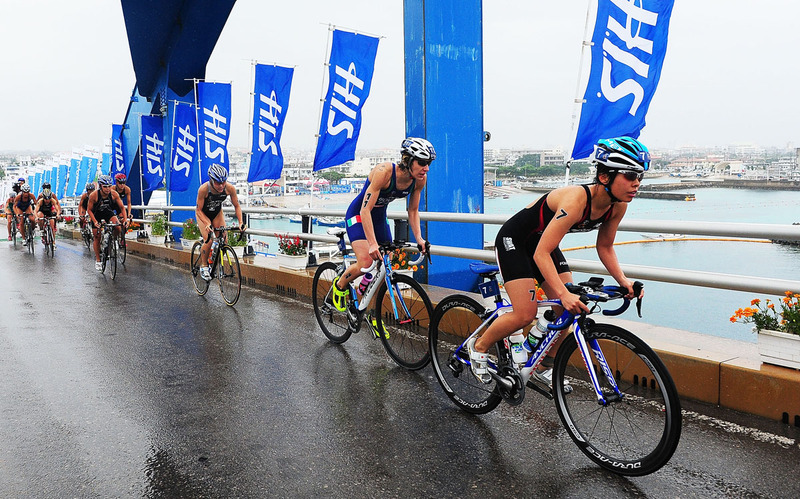 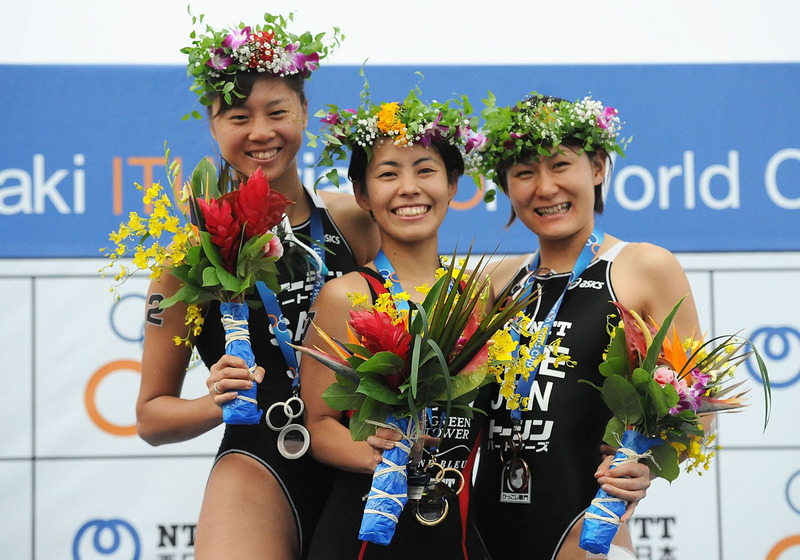 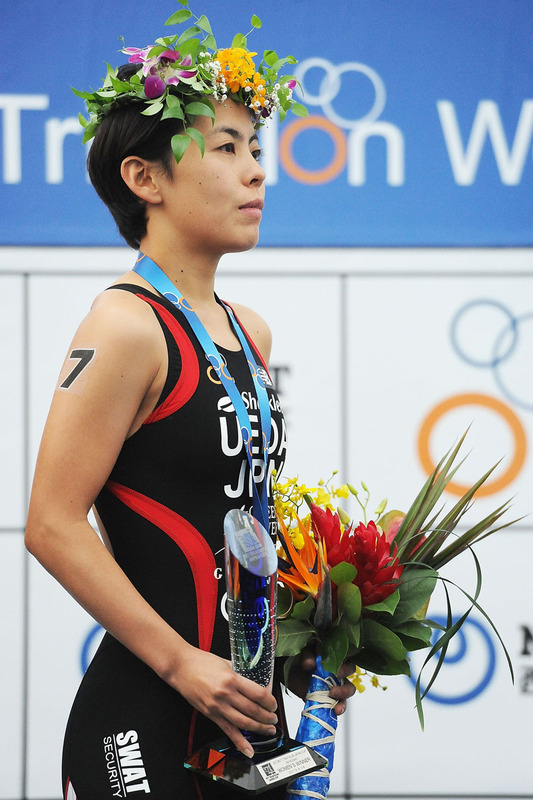 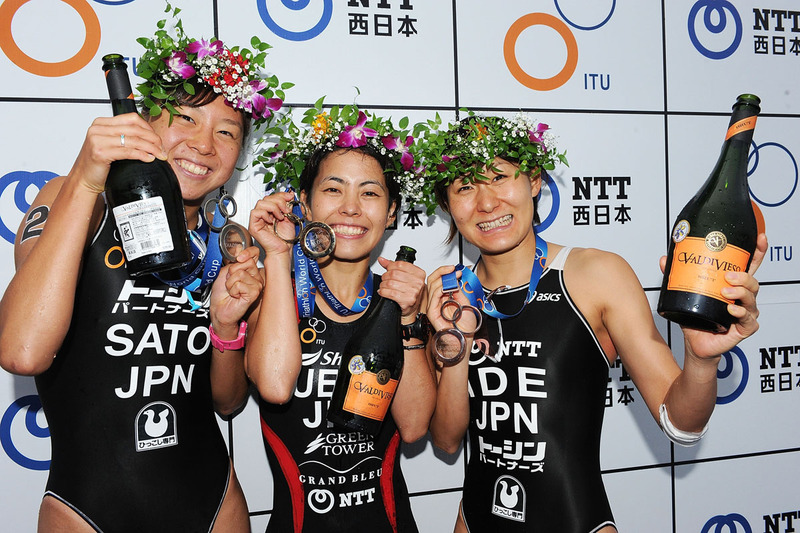 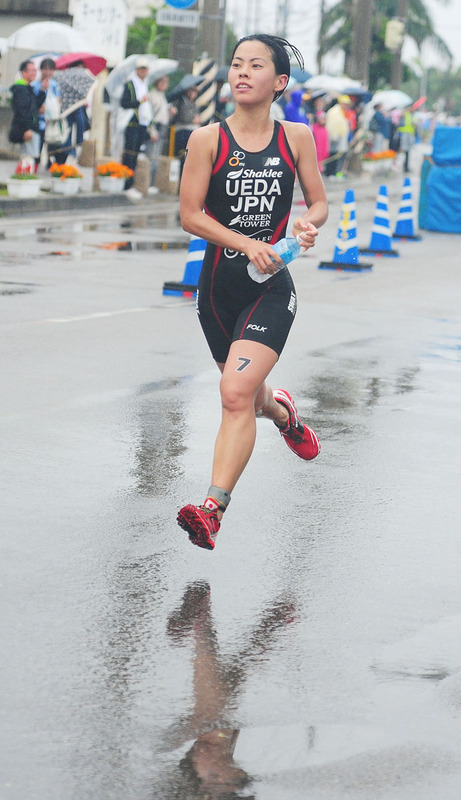 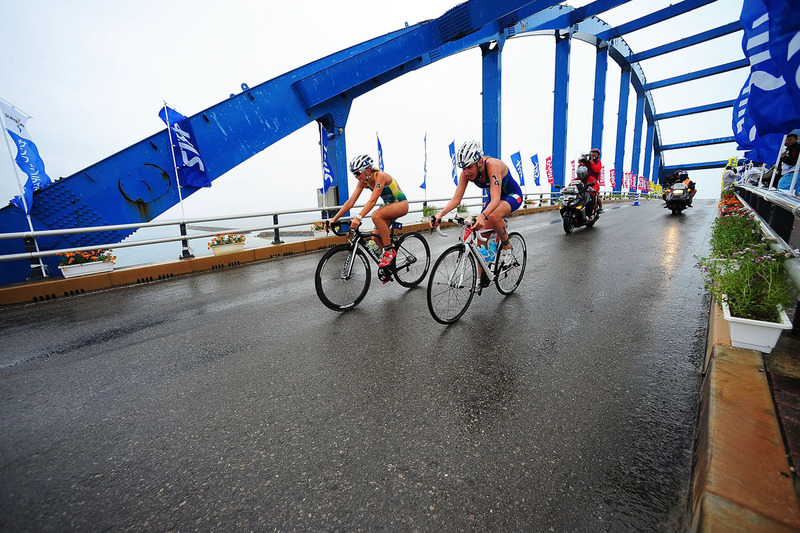 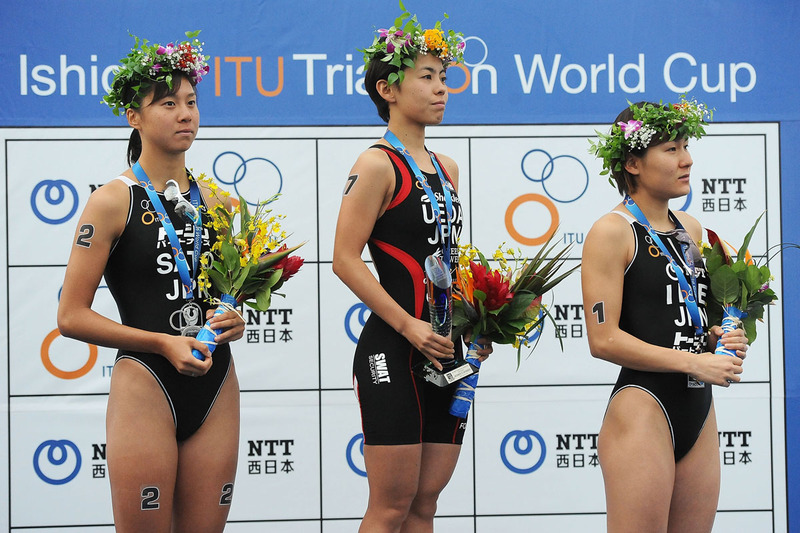 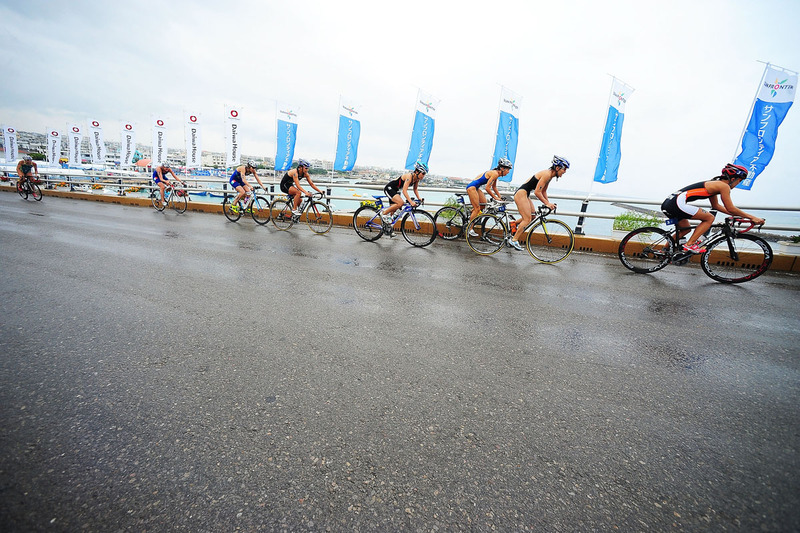 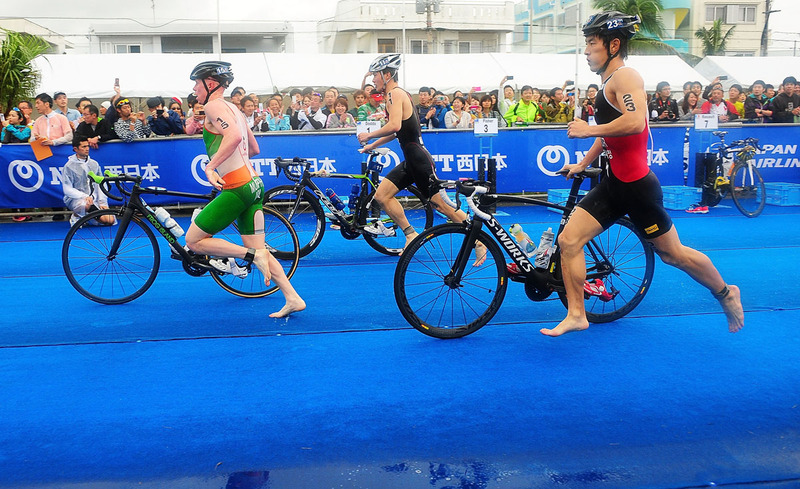 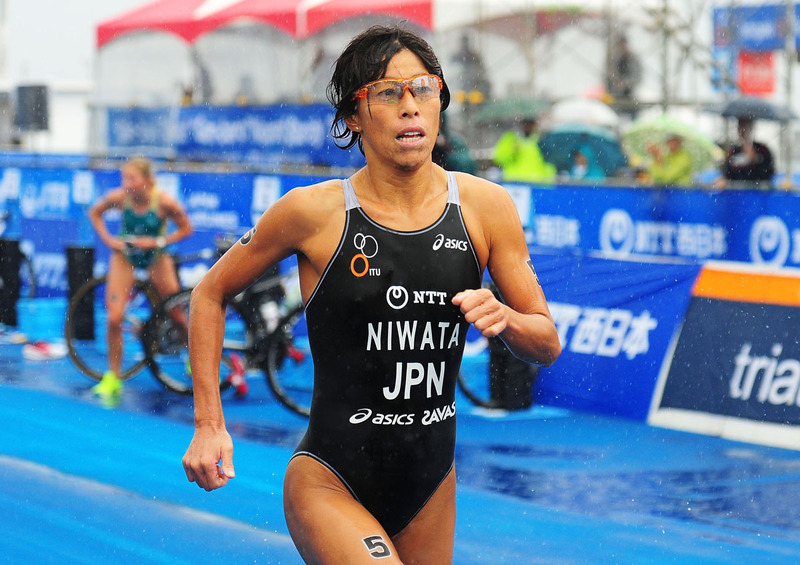 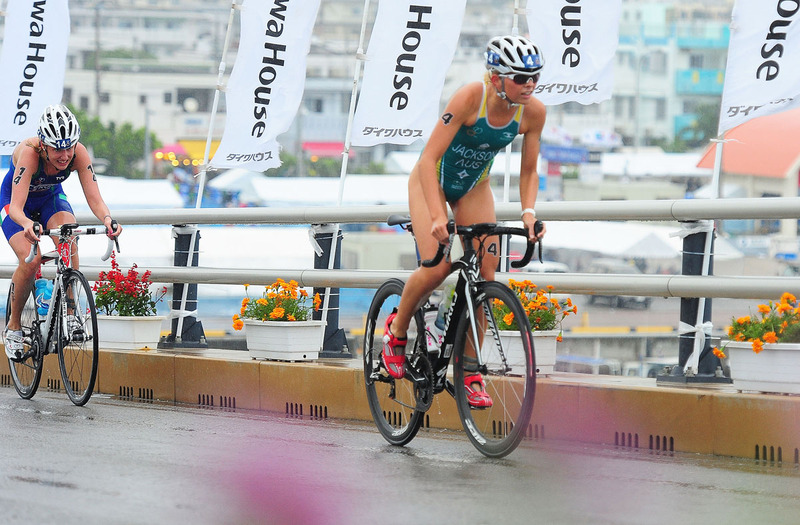 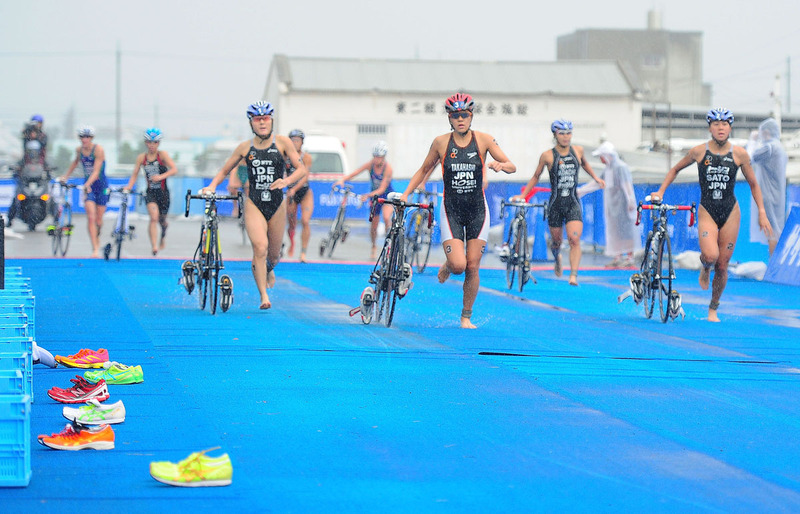 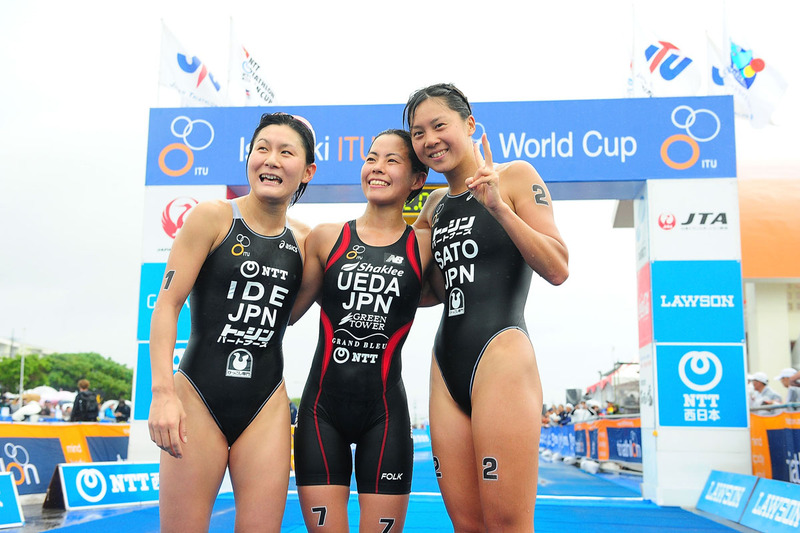 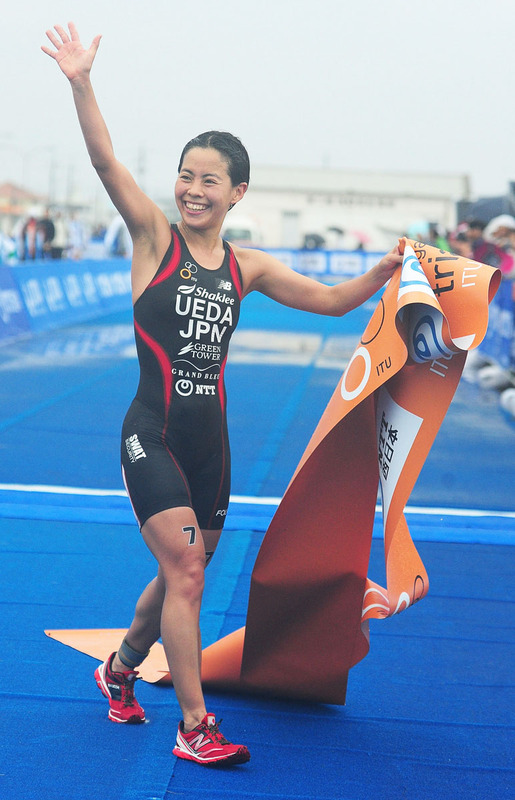 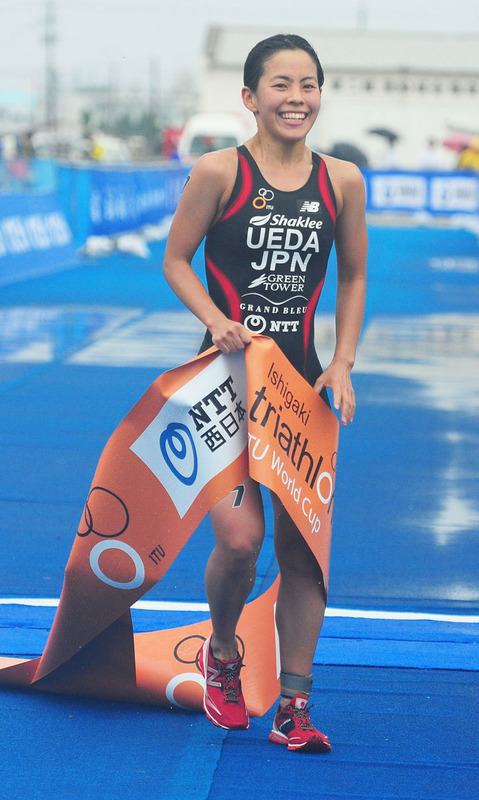 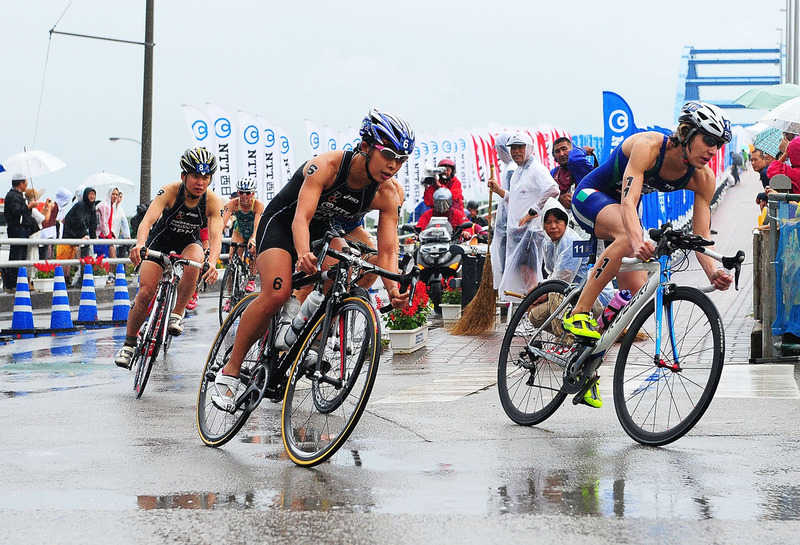 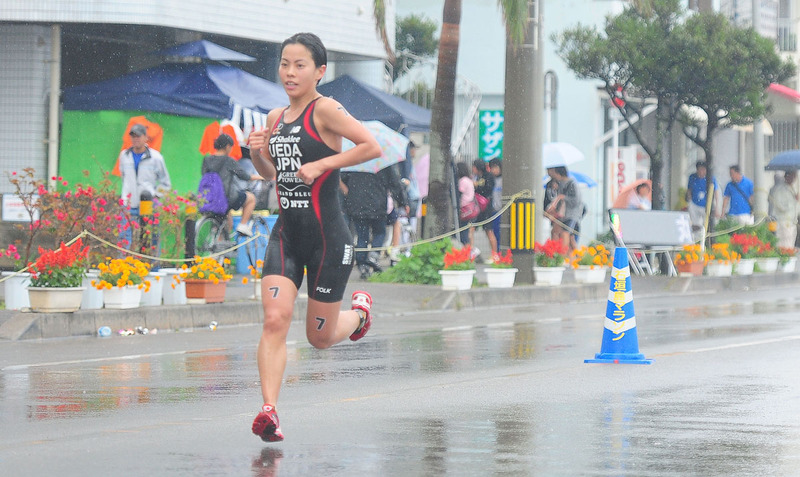 Although wet conditions plagued the women’s race on Sunday, that didn’t stop a strong Japanese team from sweeping the podium in front of a home crowd. 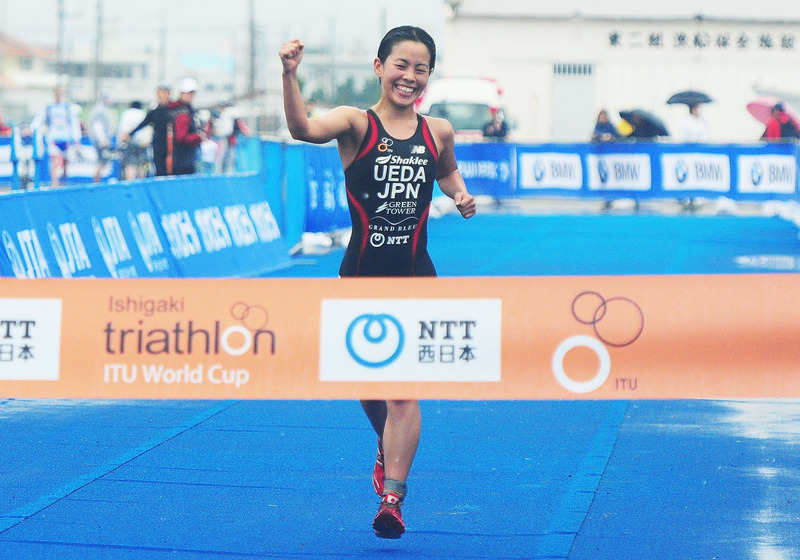 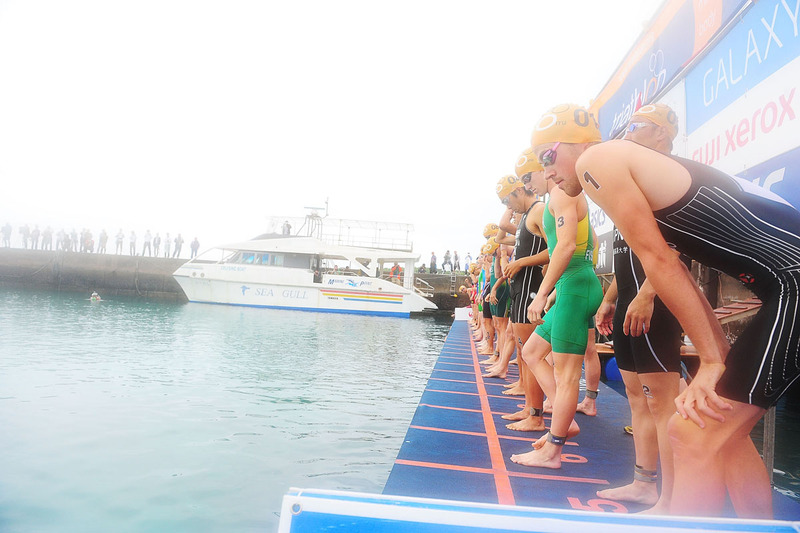 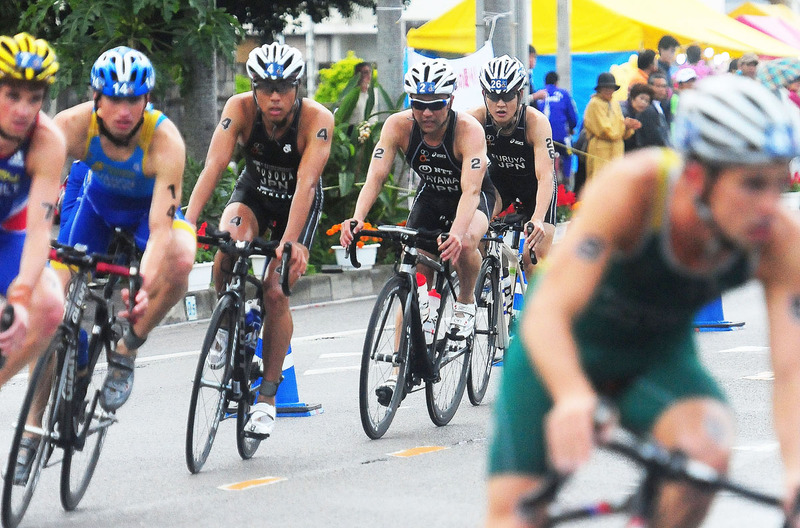 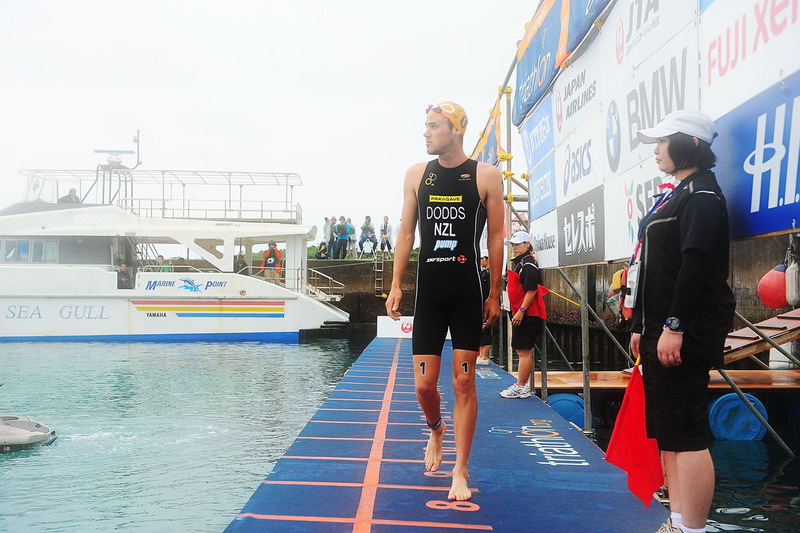 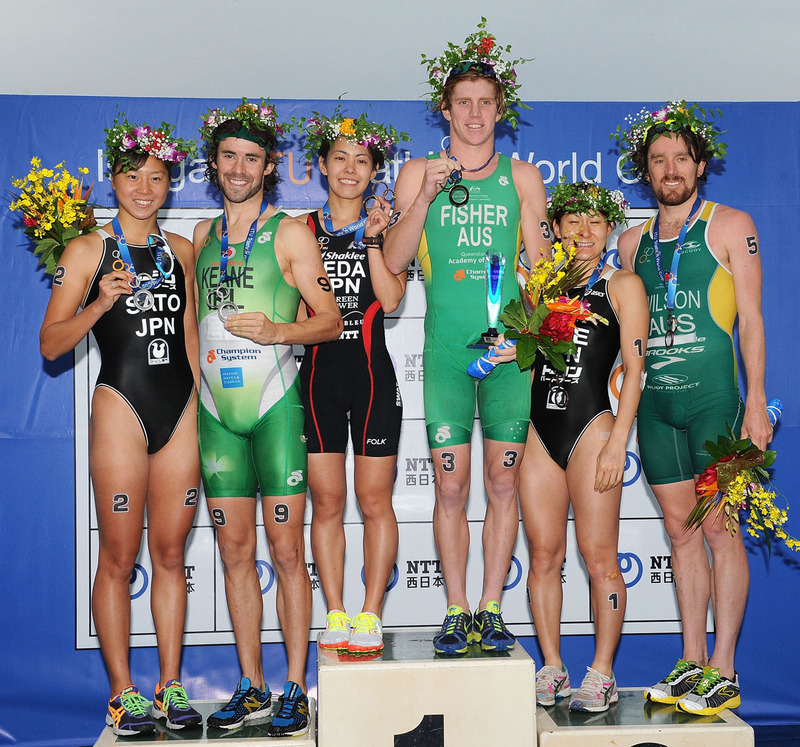 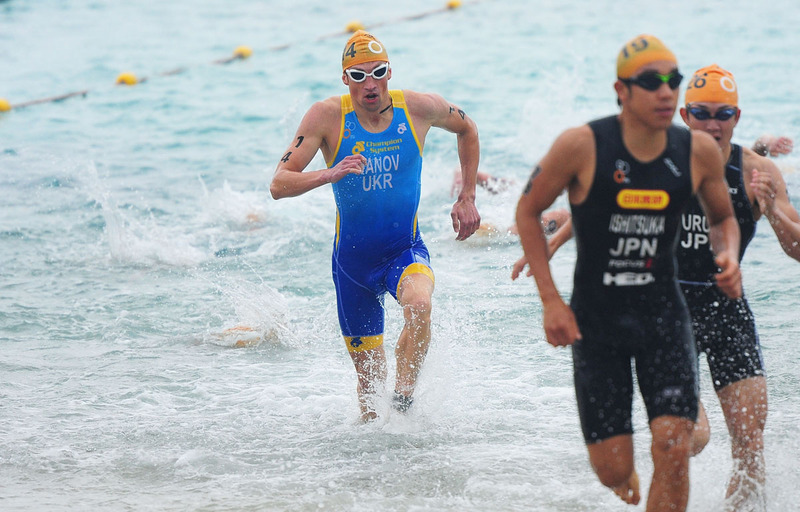 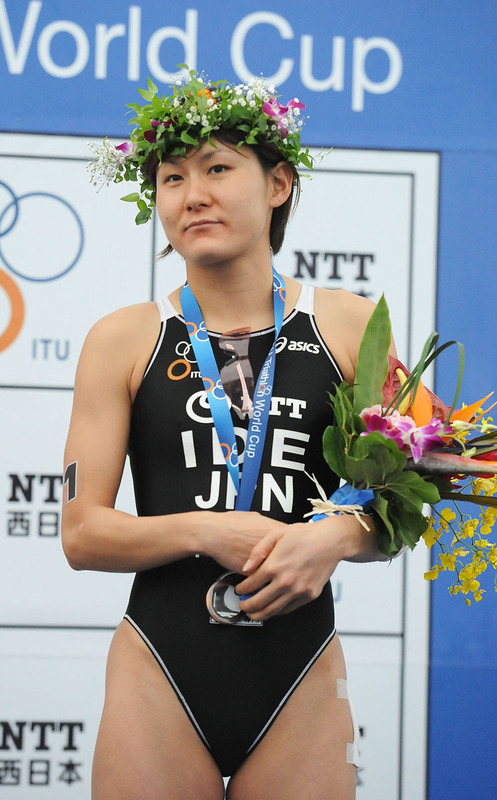 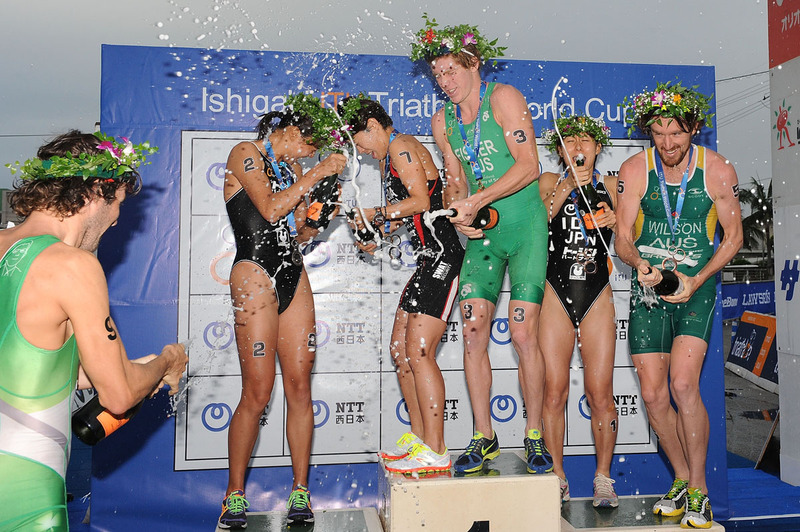 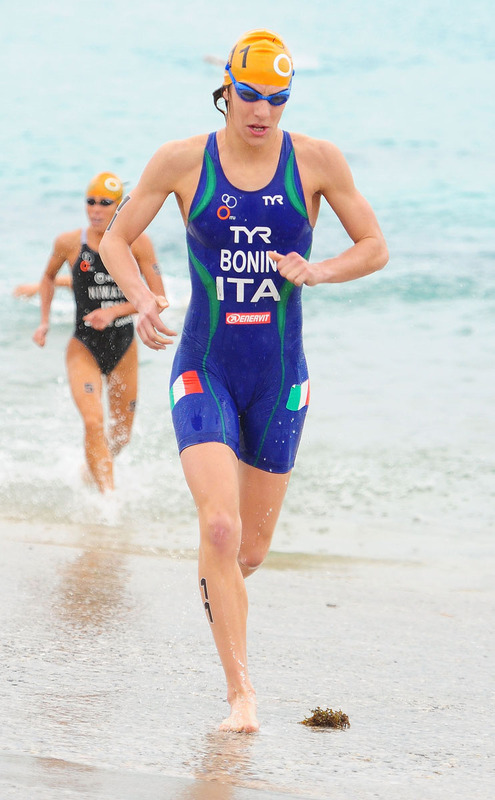 The World Cup circuit heads to Asia for the second stop of the series in Ishigaki where New Zealand's Tony Dodds and Japan's own Juri Ide will headline the start list.